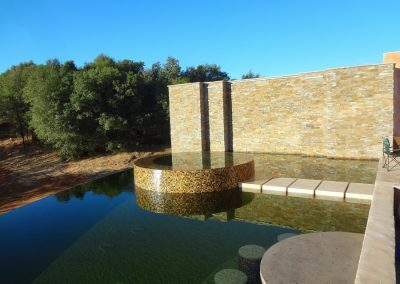 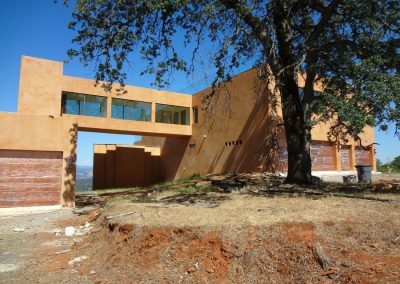 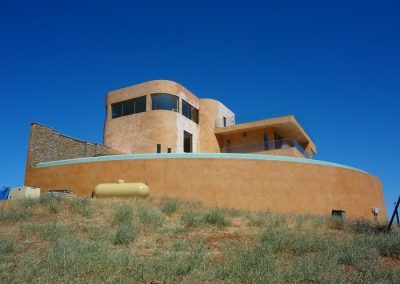 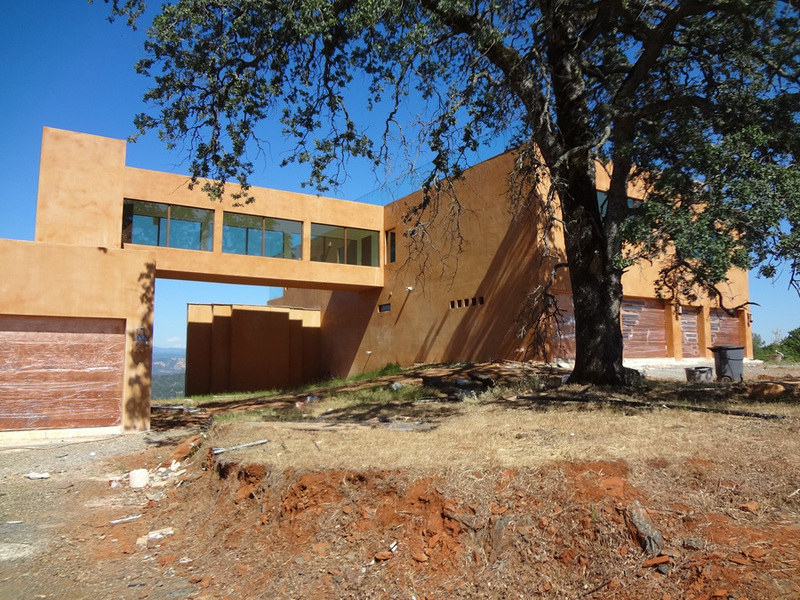 Situated on the foothills of the Sierra Nevada in Northern California, Casa Bella Verde is a magnificent example of energy efficiency, sustainability, and design ingenuity. 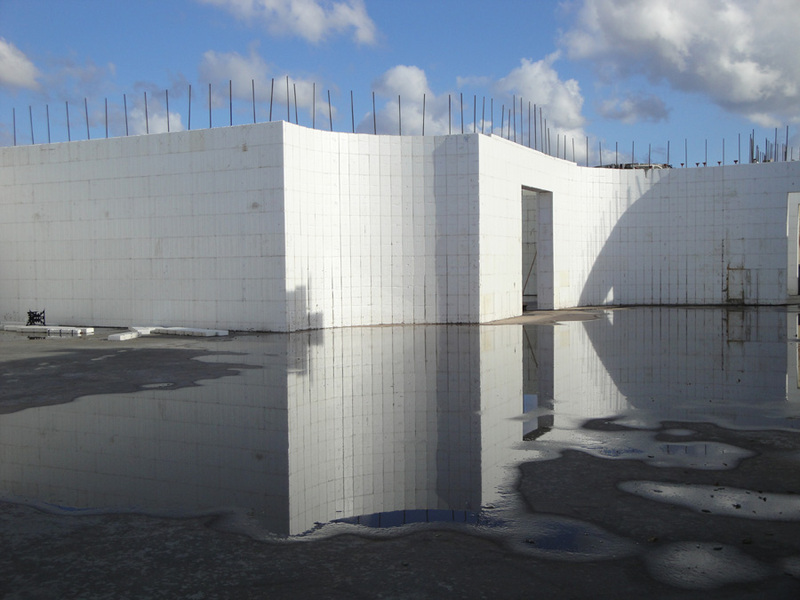 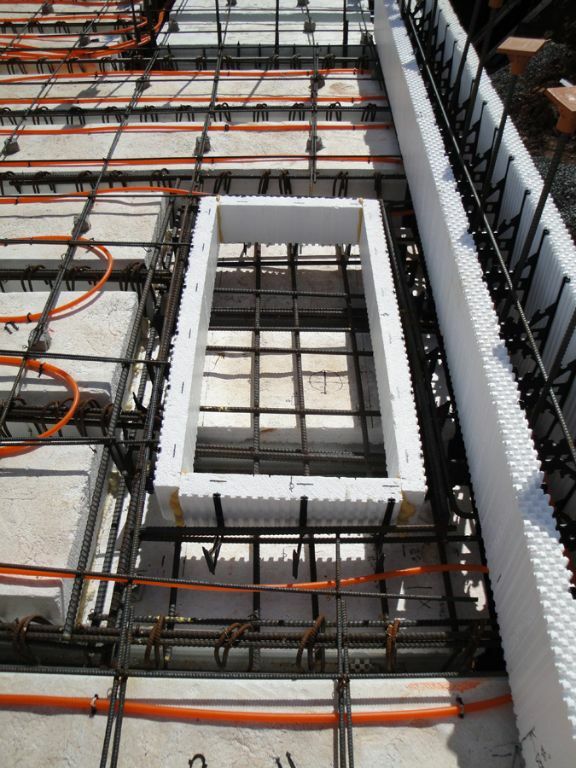 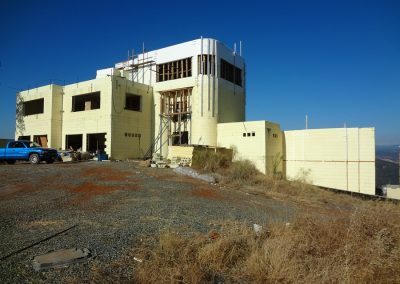 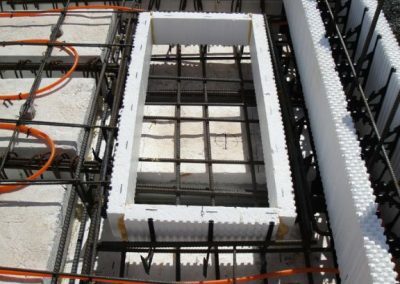 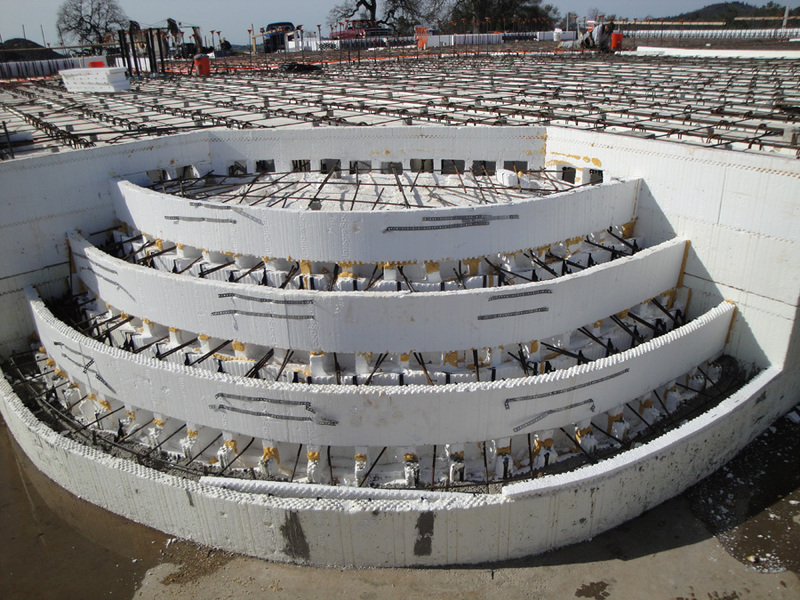 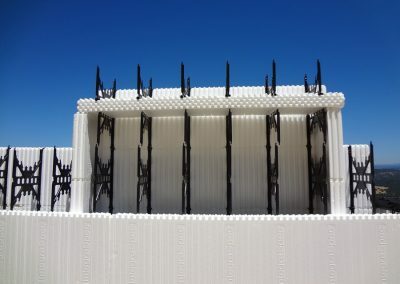 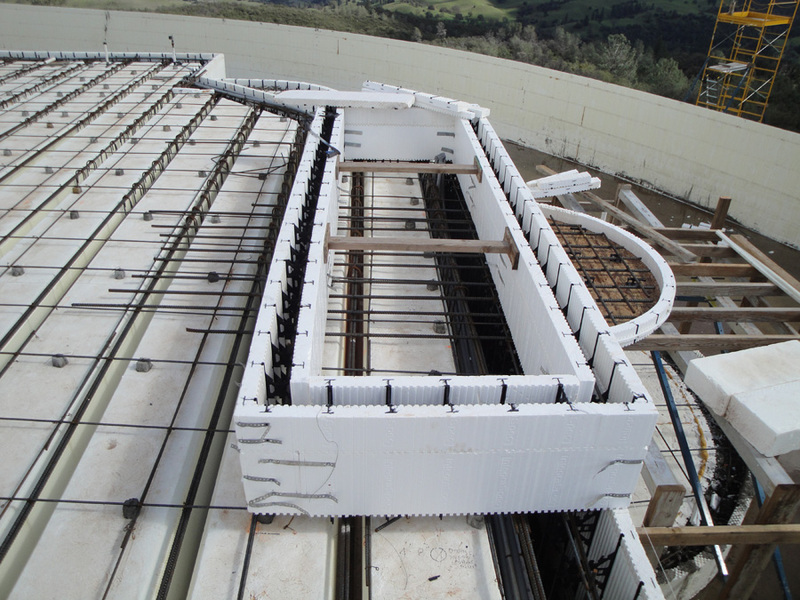 More than that, it showcases how ICF technology can be used in an astounding array of construction situations. 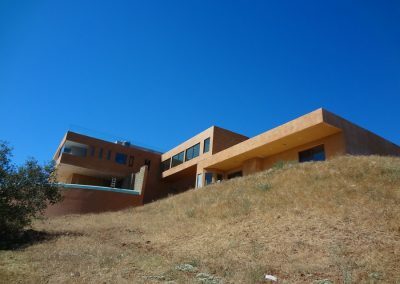 The main home and attached guest house have a combined 9,000 sq. 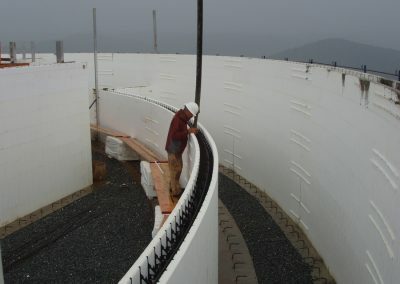 ft. of conditioned floor space. 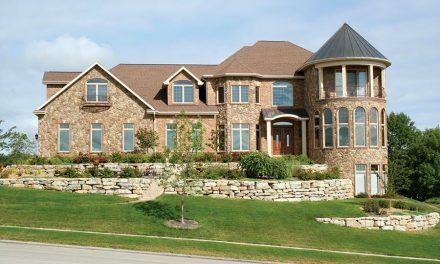 Yet the homes used more than 30,000 sq. 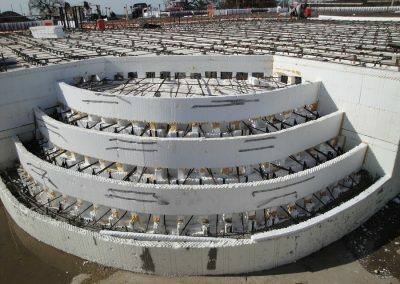 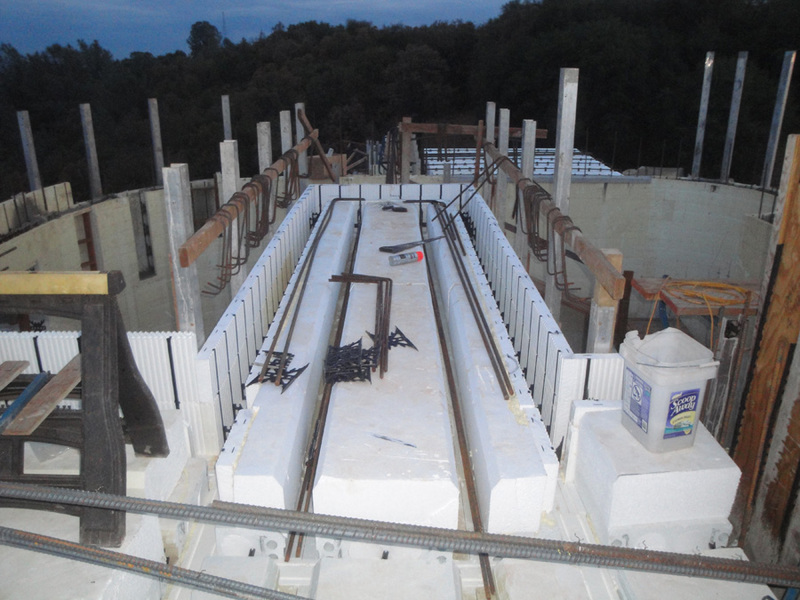 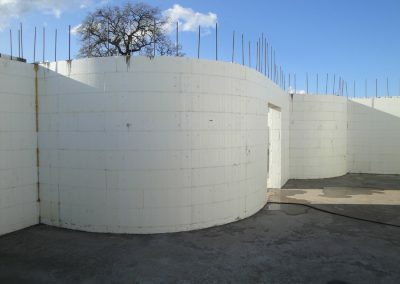 ft. of ICF wall forms, and an additional 30,000 sq. 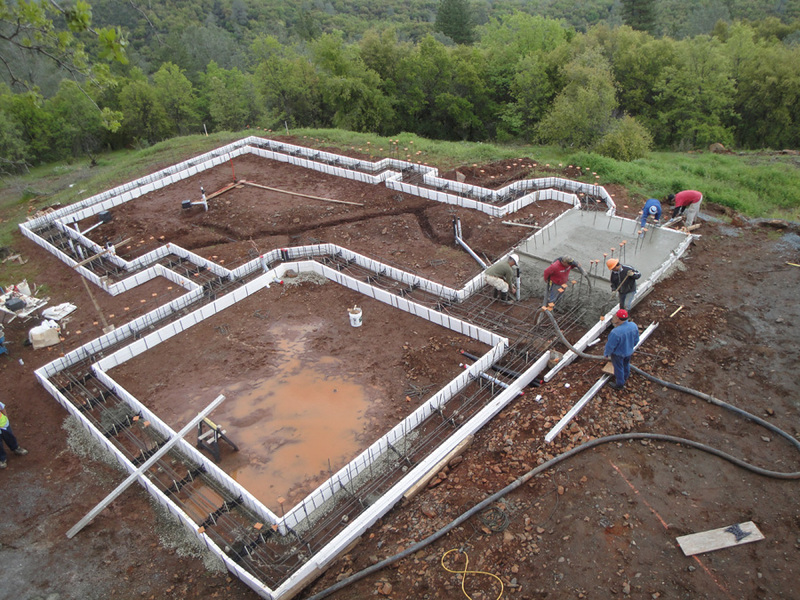 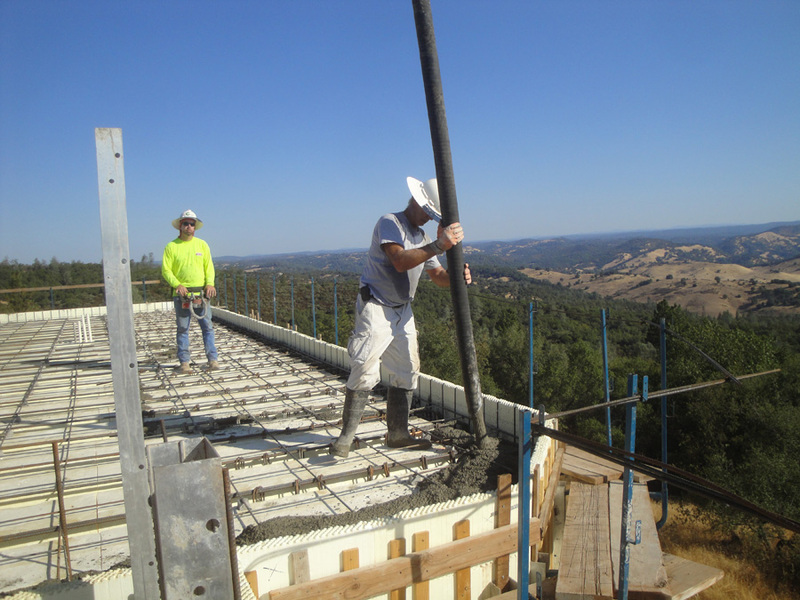 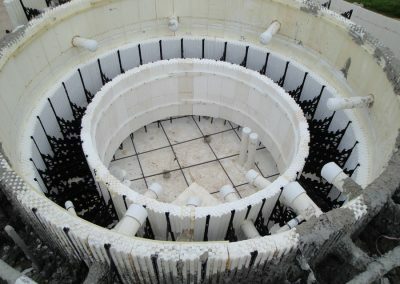 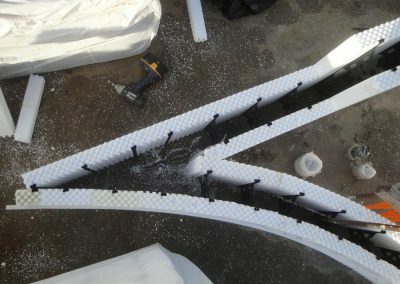 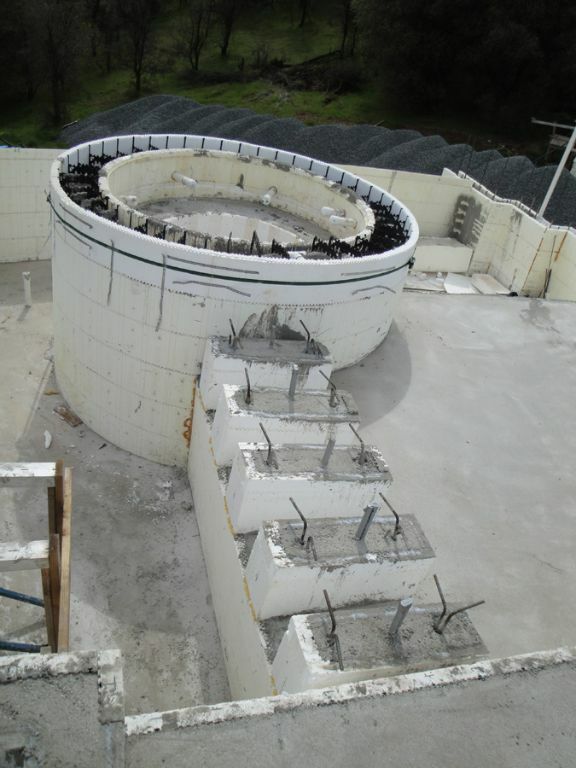 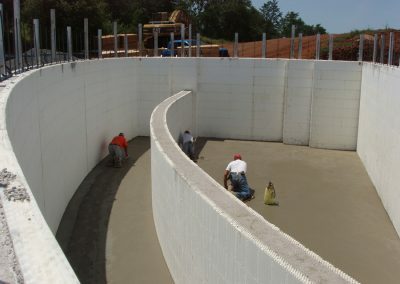 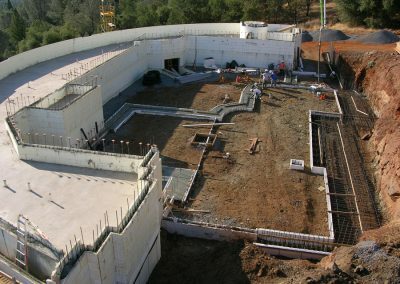 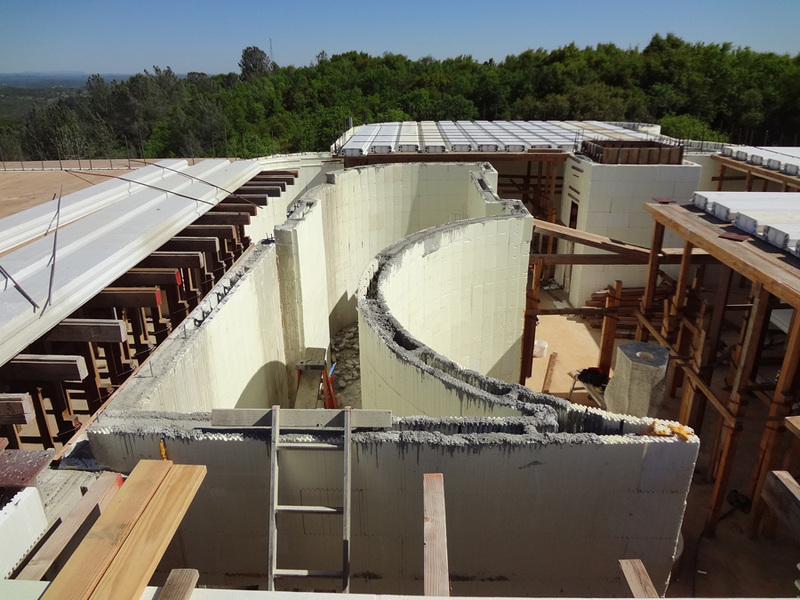 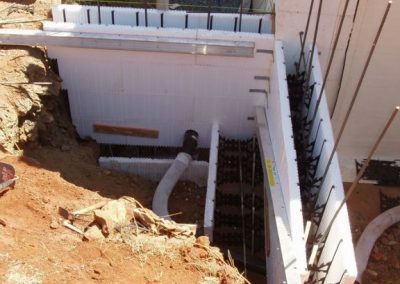 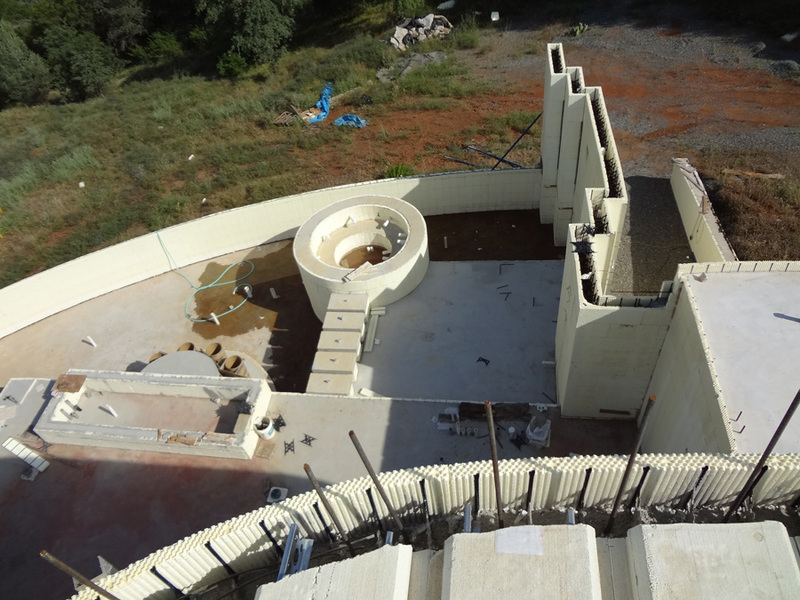 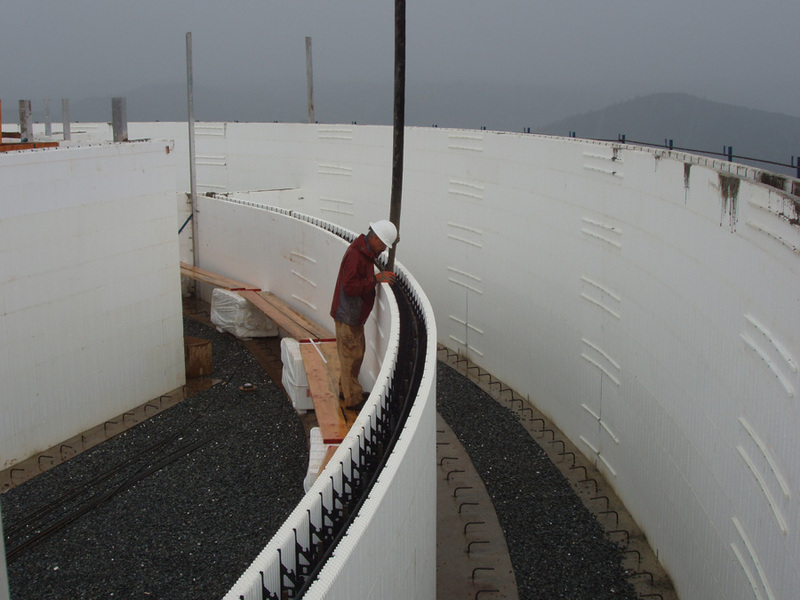 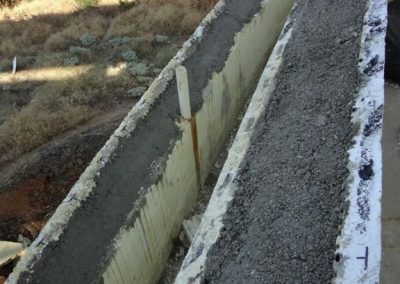 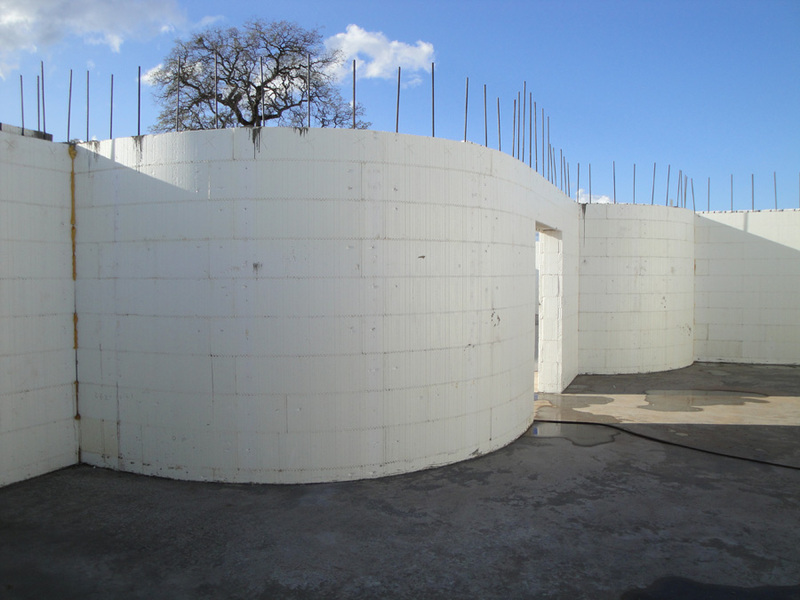 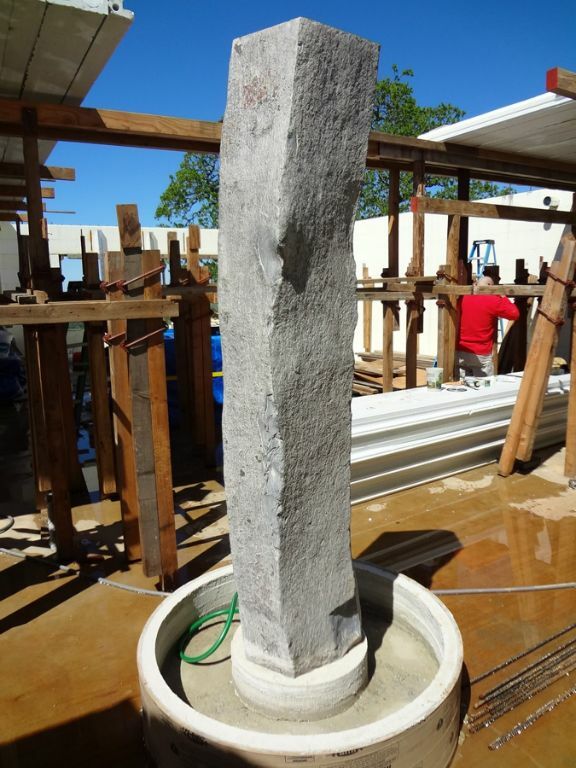 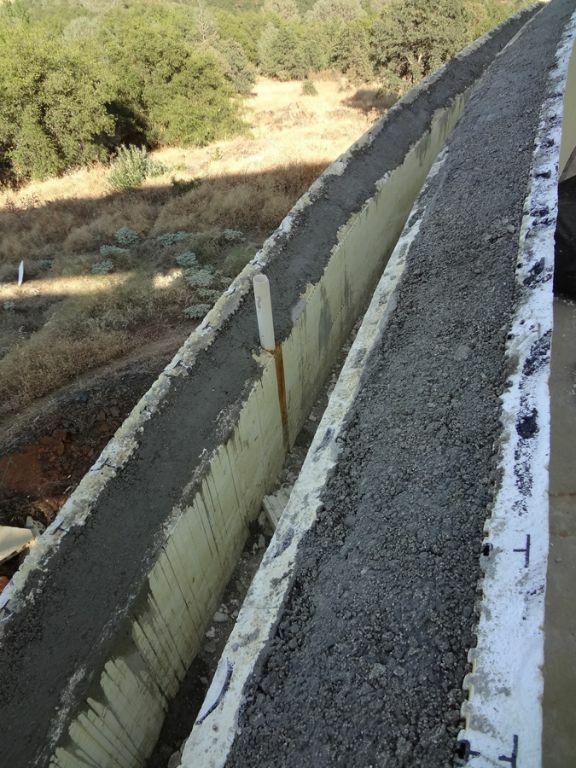 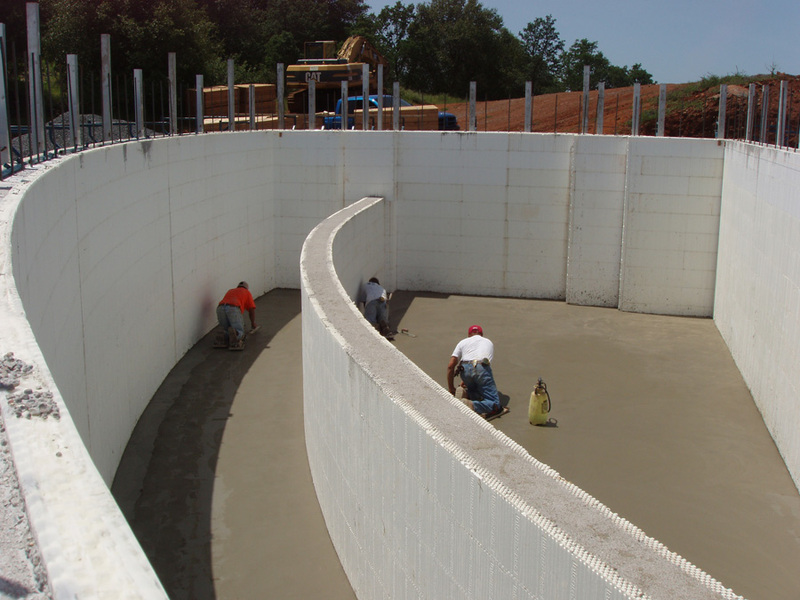 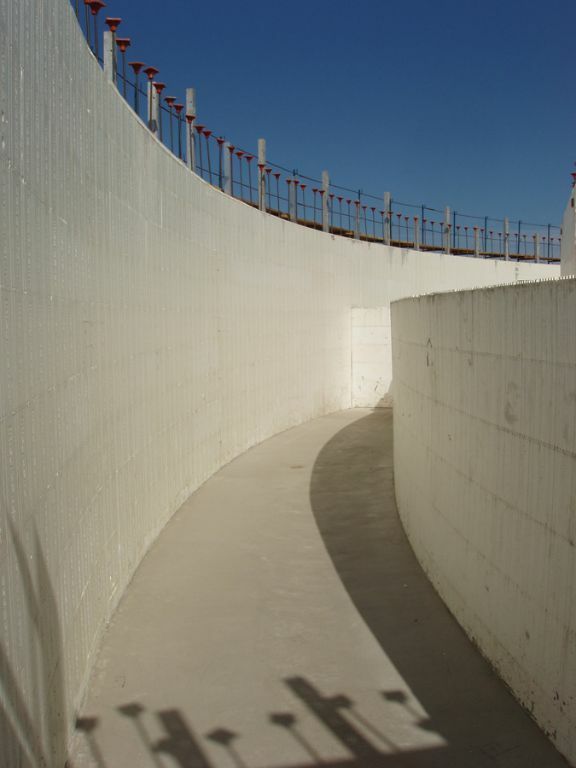 ft. of ICF forms in landscaping, pool construction, and other uses. 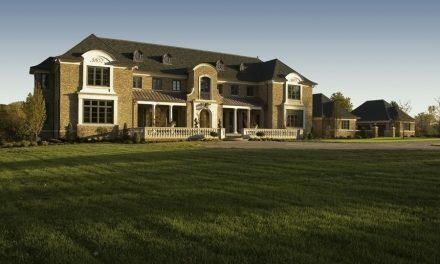 An additional 15,000 sq. 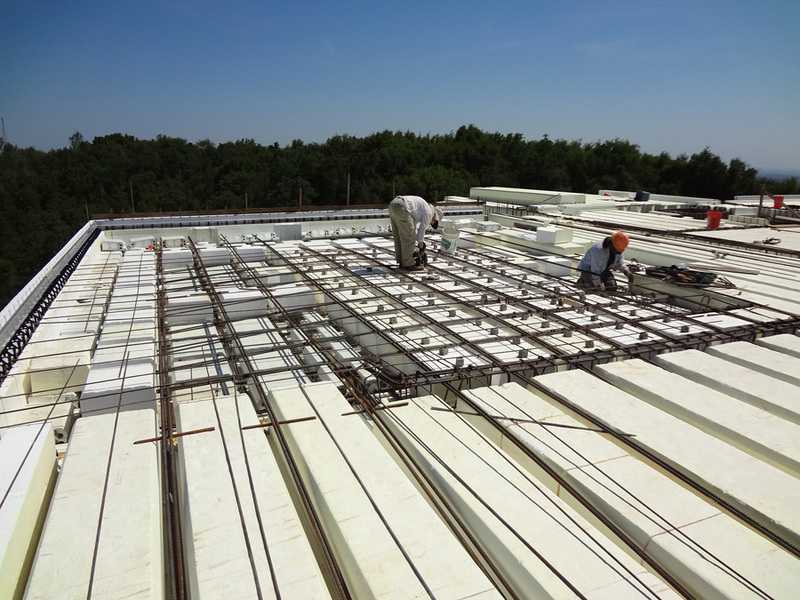 ft. of Insul-Deck EPS decking was also installed. 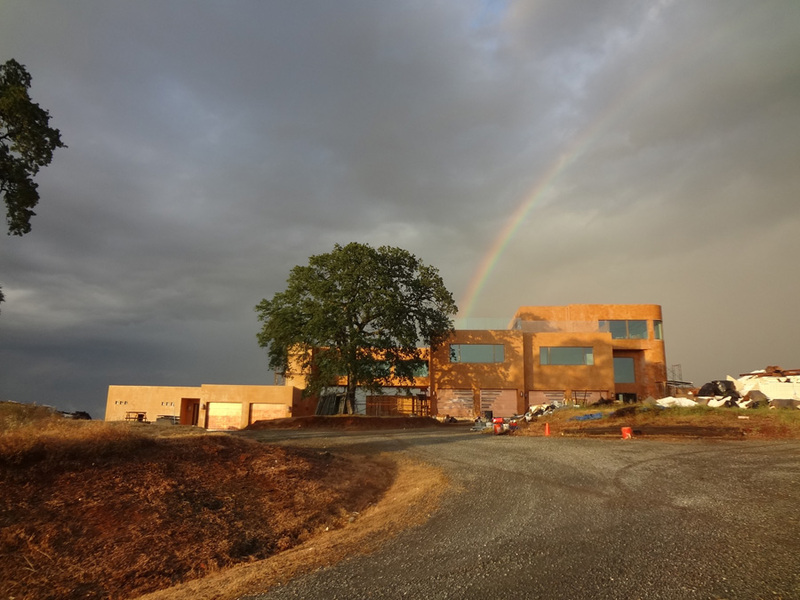 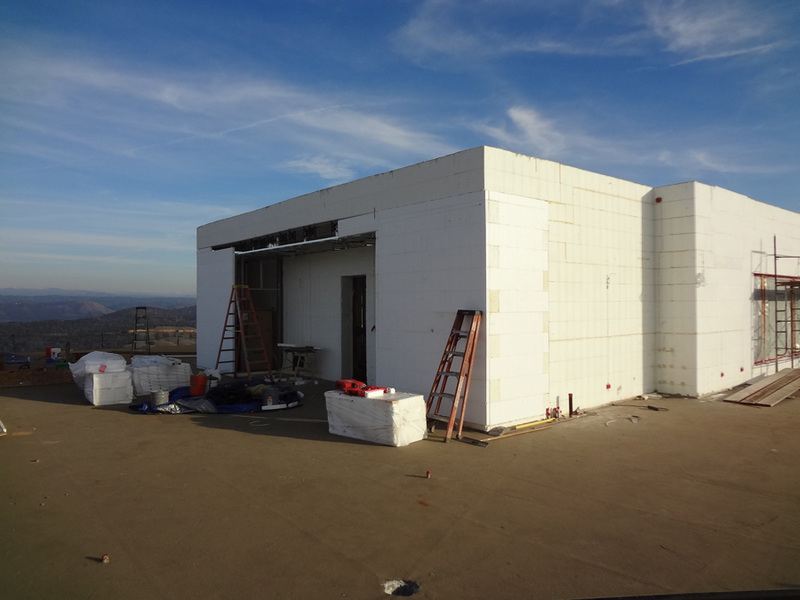 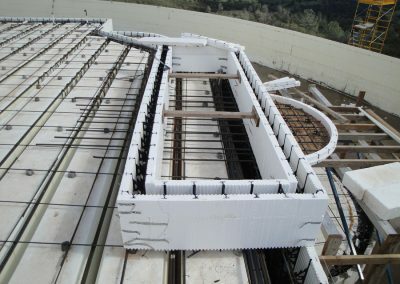 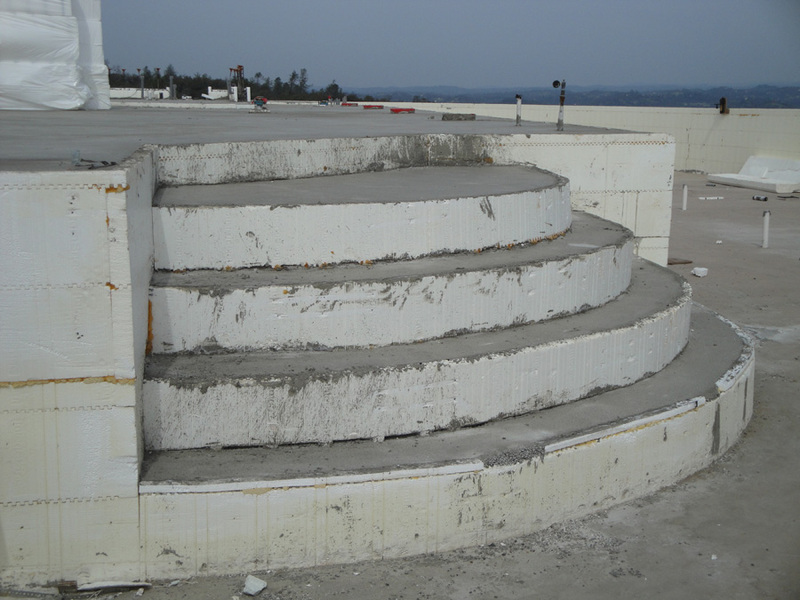 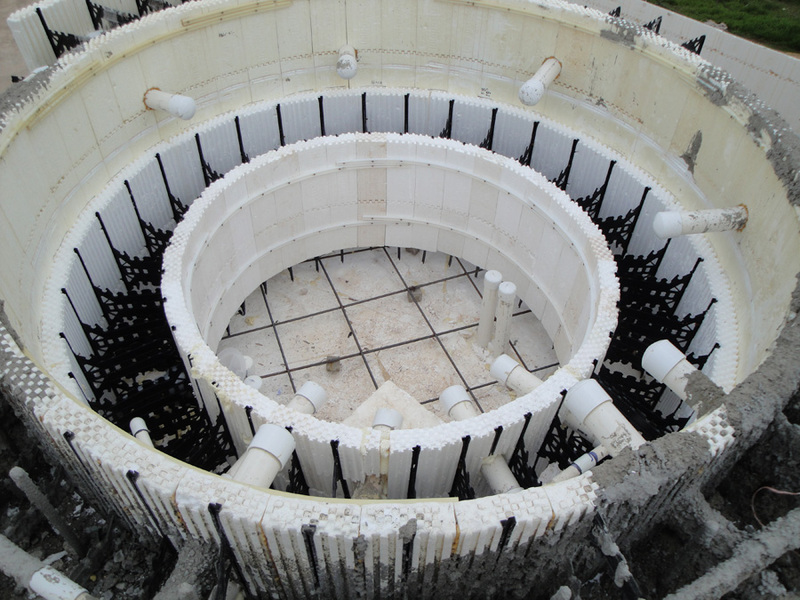 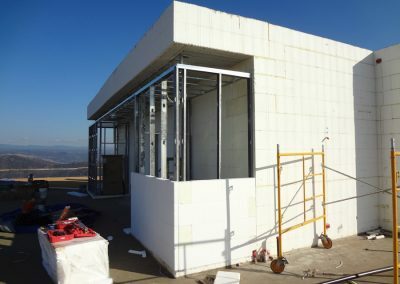 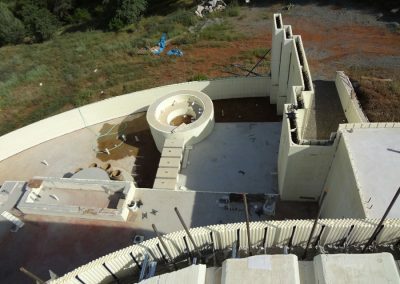 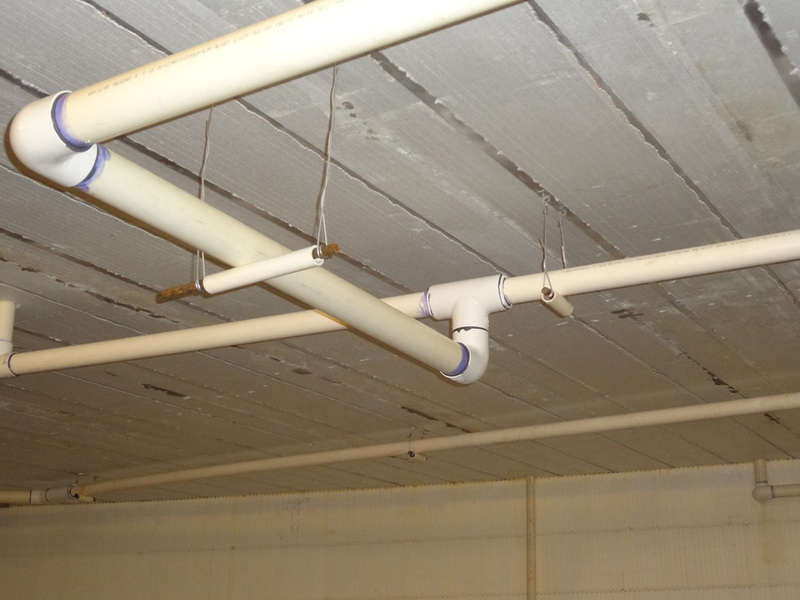 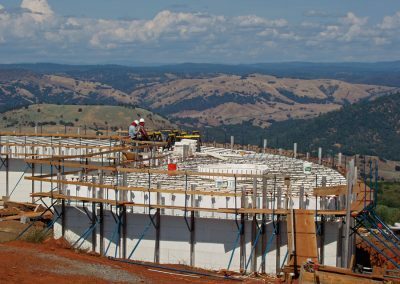 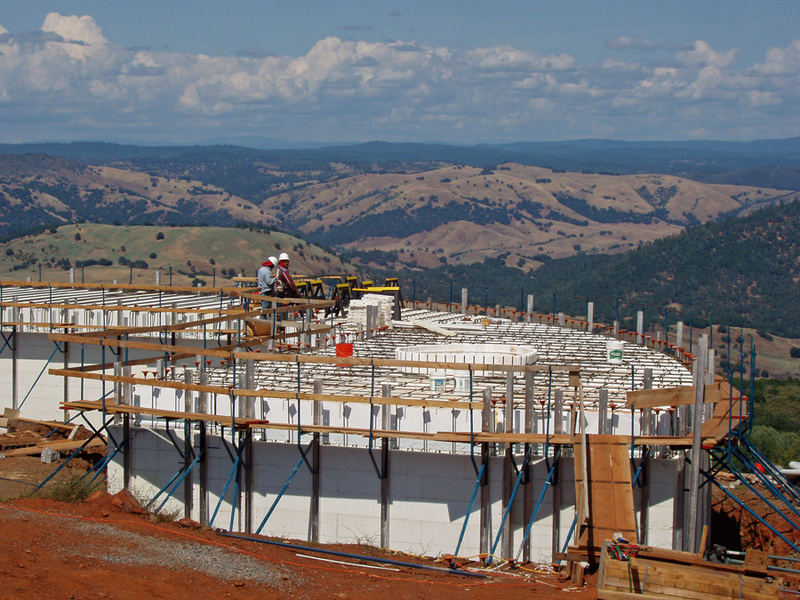 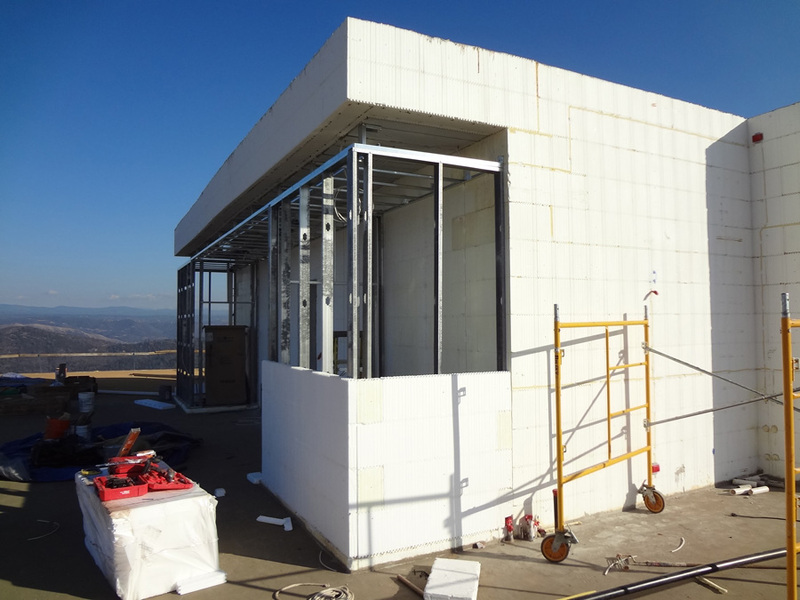 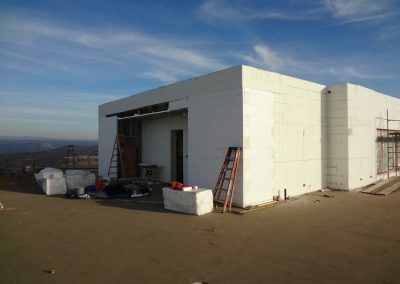 “We tried to apply ICF technology to every application of the project building process,” says Nicholas Nikiforuk, the IntegraSpec executive that supplied forms, trained installers, and oversaw the construction process. 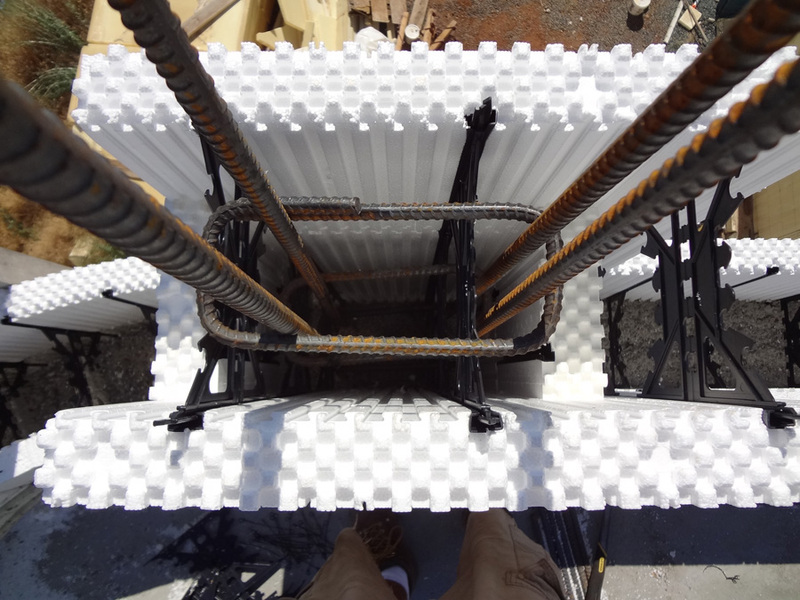 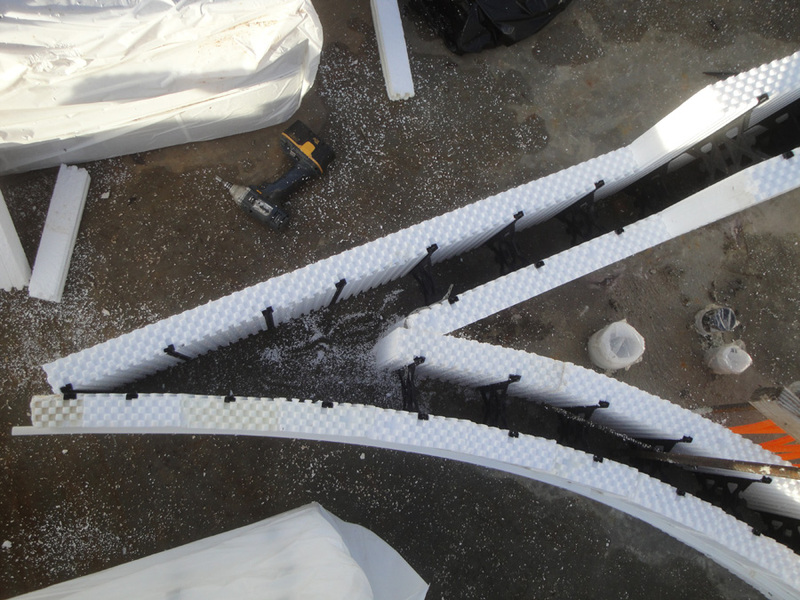 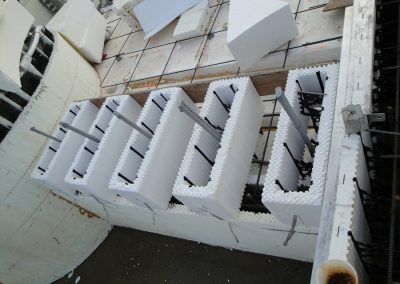 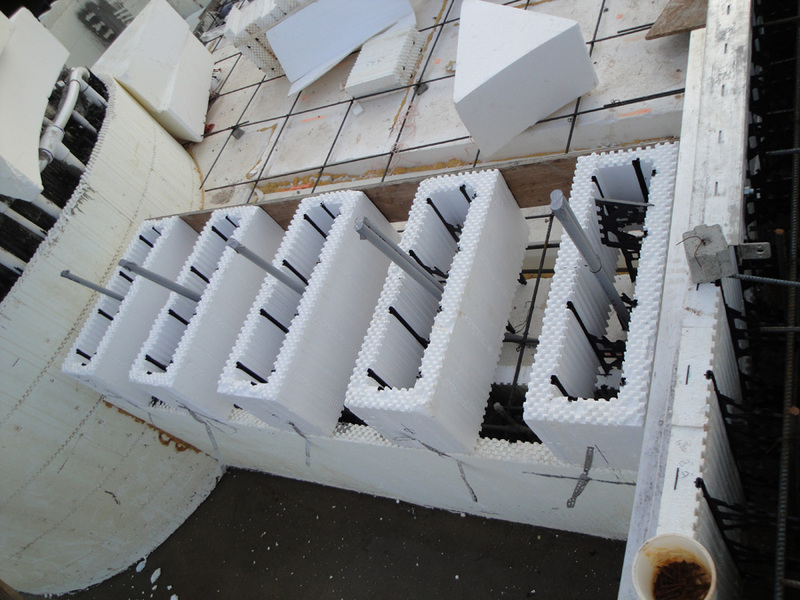 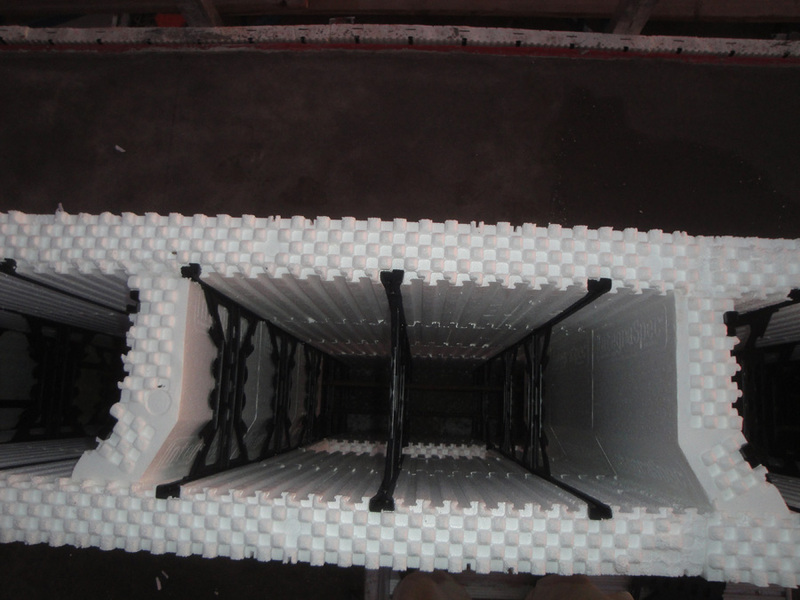 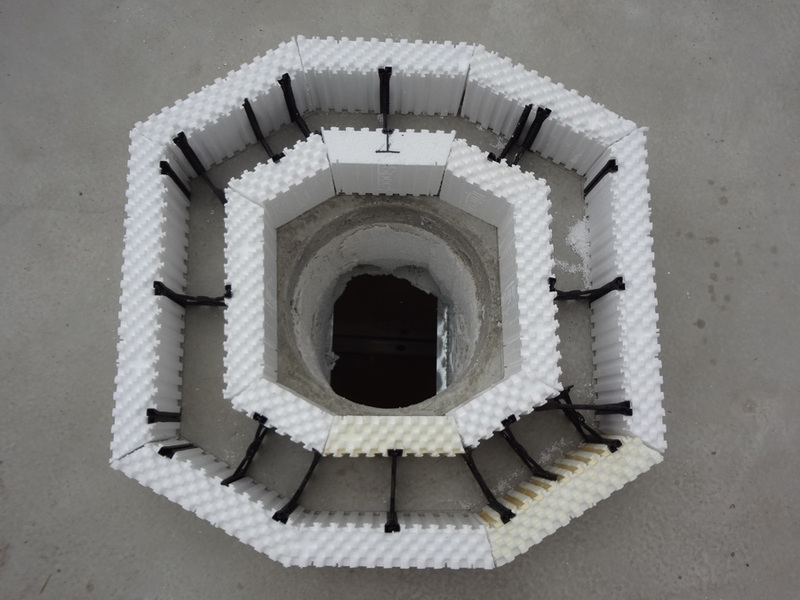 “We created new uses for standard ICF components and found ways they could help solve design issues. 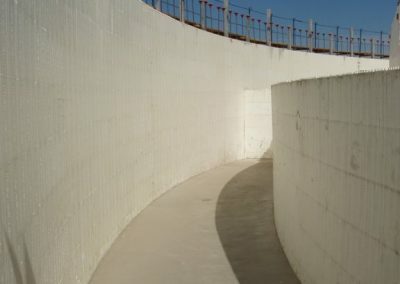 The massive curved walls run 180 feet long on radius of 66’ 5” and 73’6”. 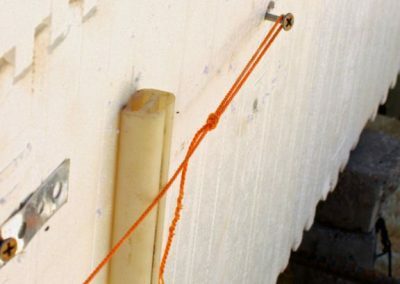 The others have radii of about three, four, seven, and eight feet. 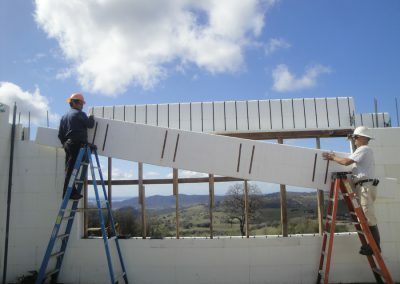 Depending on the amount of curvature, the inner panel was either shortened by a few inches every 12 feet, or miter-cut into pieces and strapped together with H-Clips. 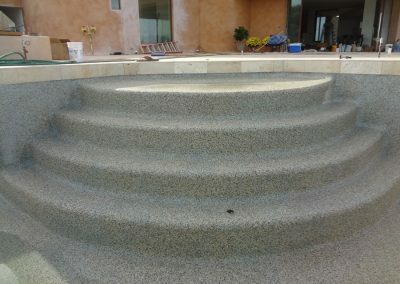 Video of this pour is available on the Casa Bella Verde website. 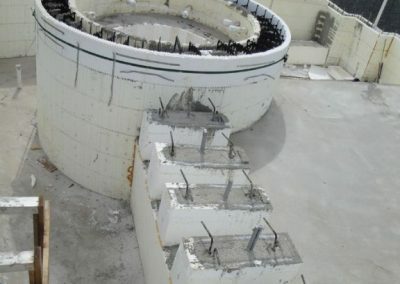 The list of creative ICF use on this project boggles the mind. 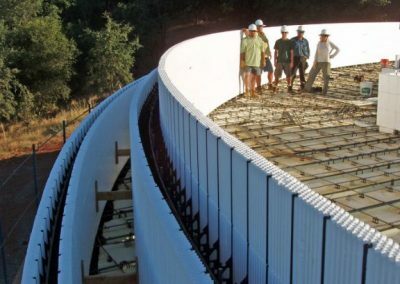 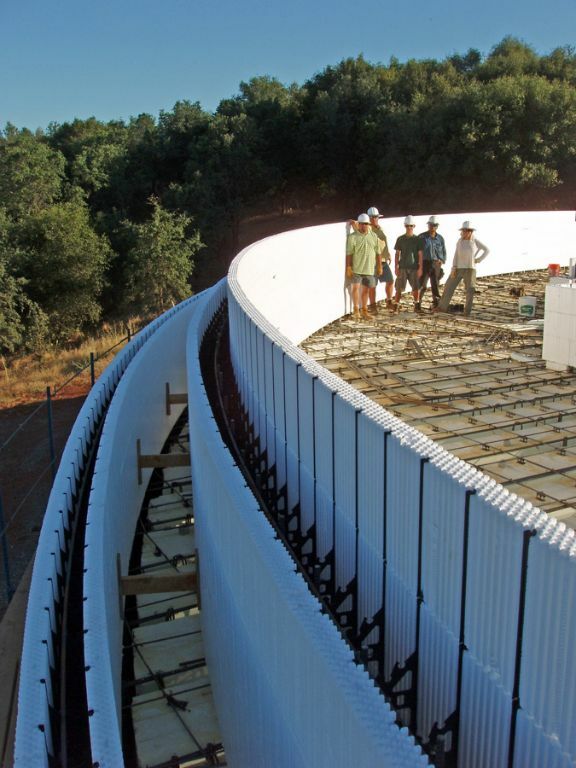 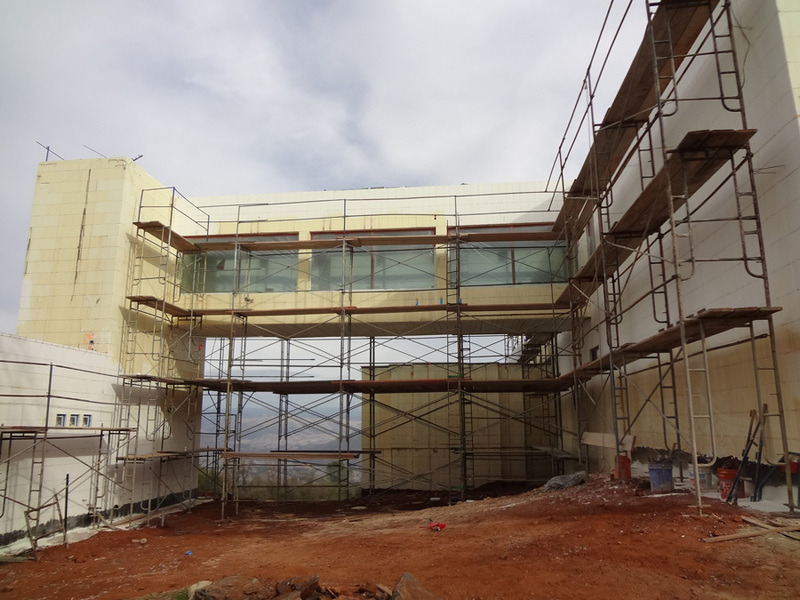 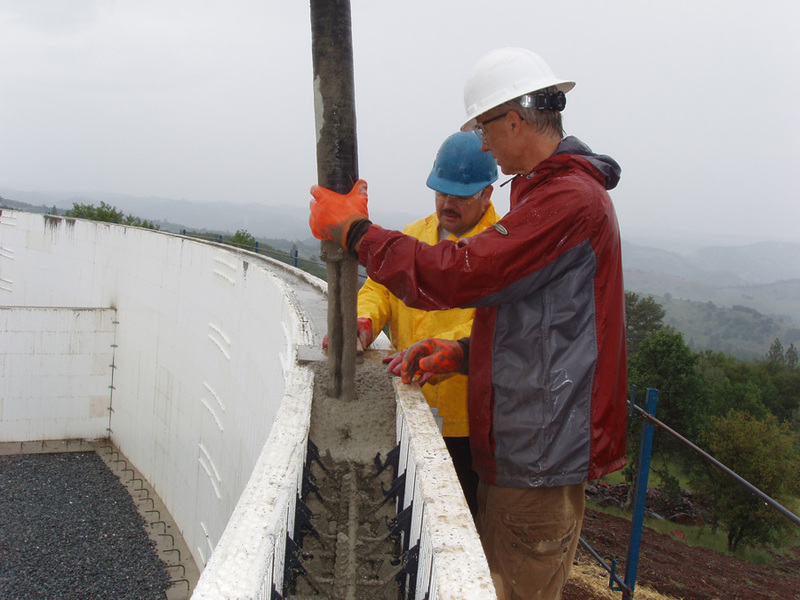 A 40-foot skybridge connecting the main living quarters to the guest house is all ICF. 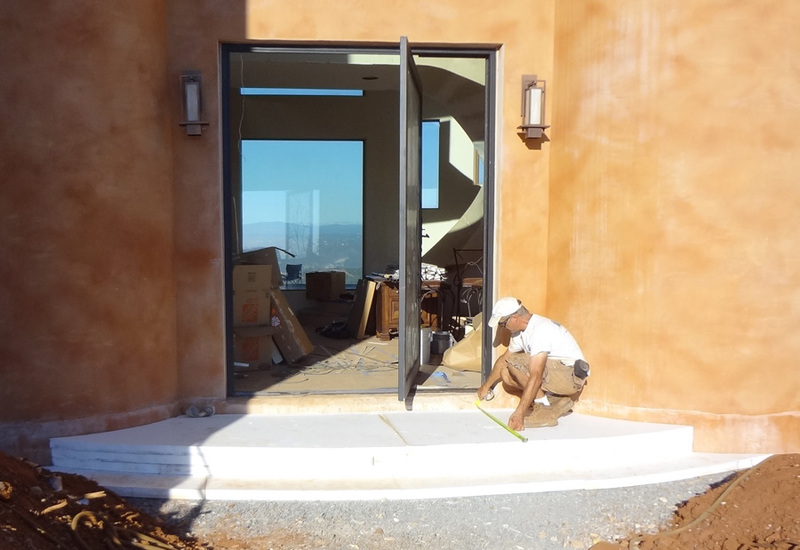 Two 14 ft. wide sliding glass doors disappear into a pocket wall allowing a seamless transition from the inside to the outside. 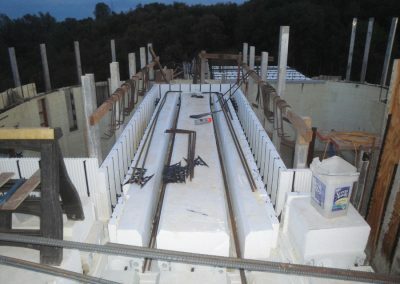 They required an ICF lintel of more than 28 feet. 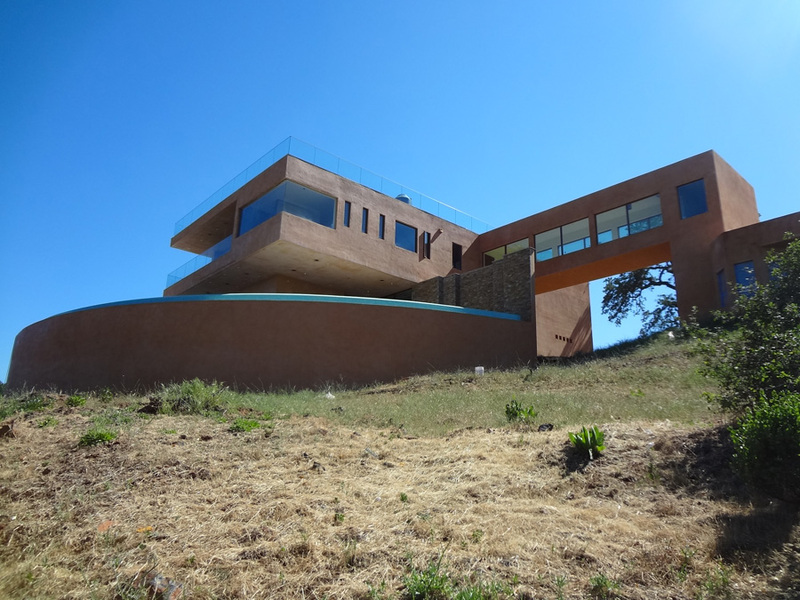 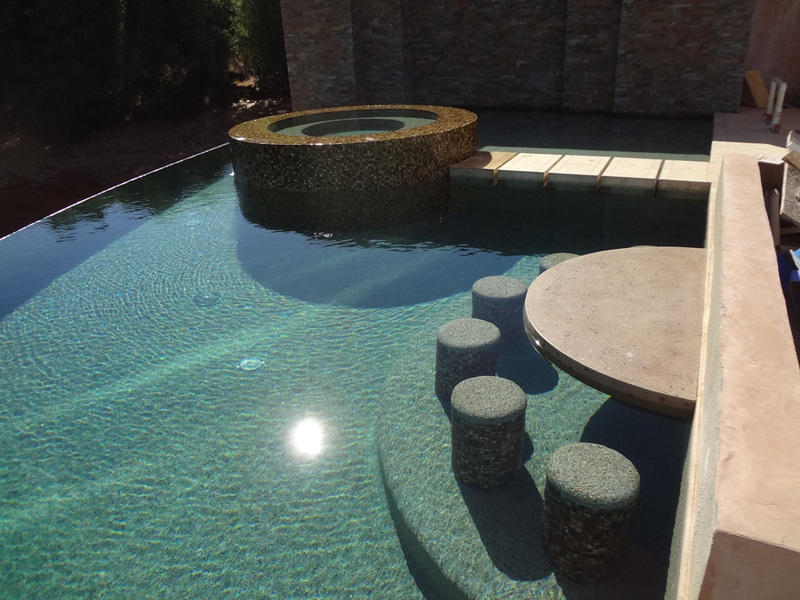 The second floor of the main house (built with Insul-Deck) cantilevers 14 feet out over the pool deck on two sides. 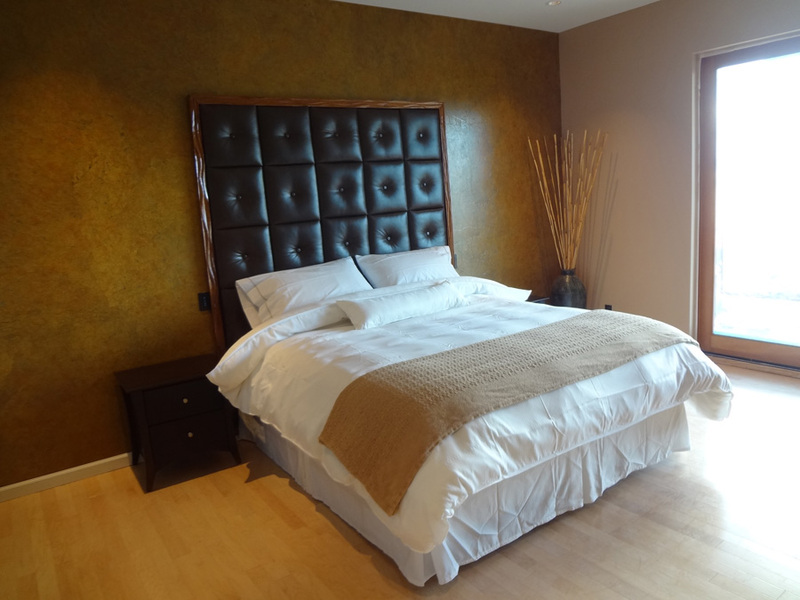 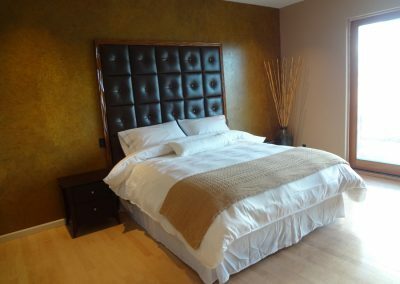 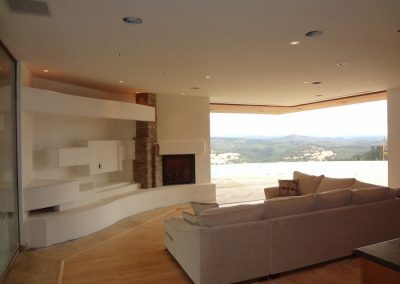 The master bedroom has a 10-foot cantilever. 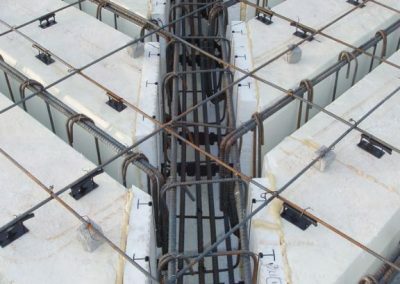 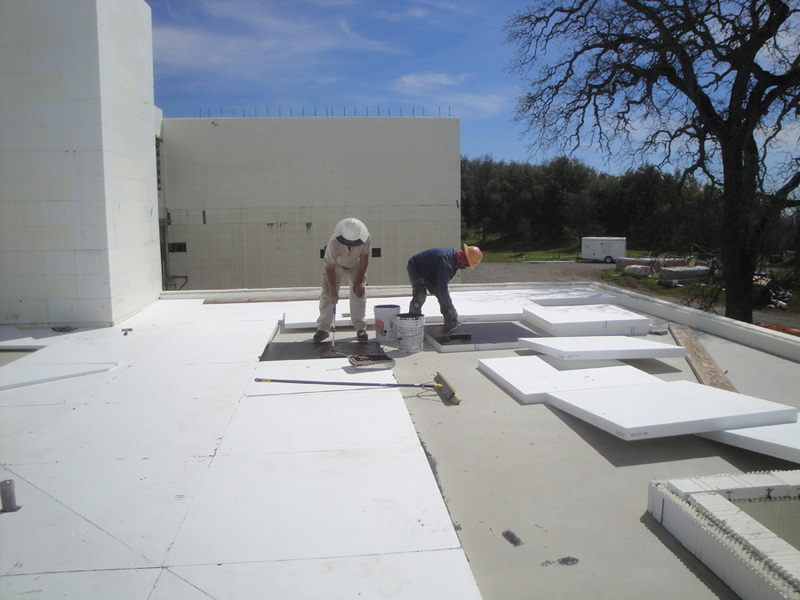 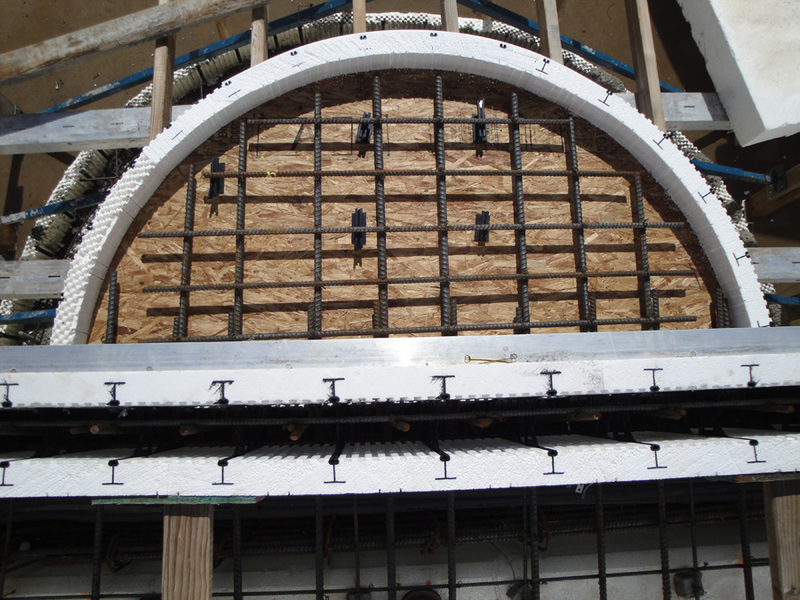 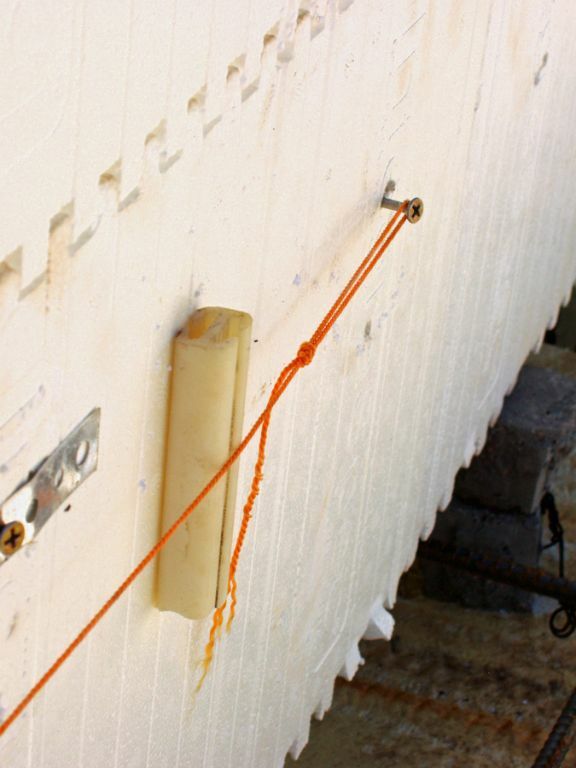 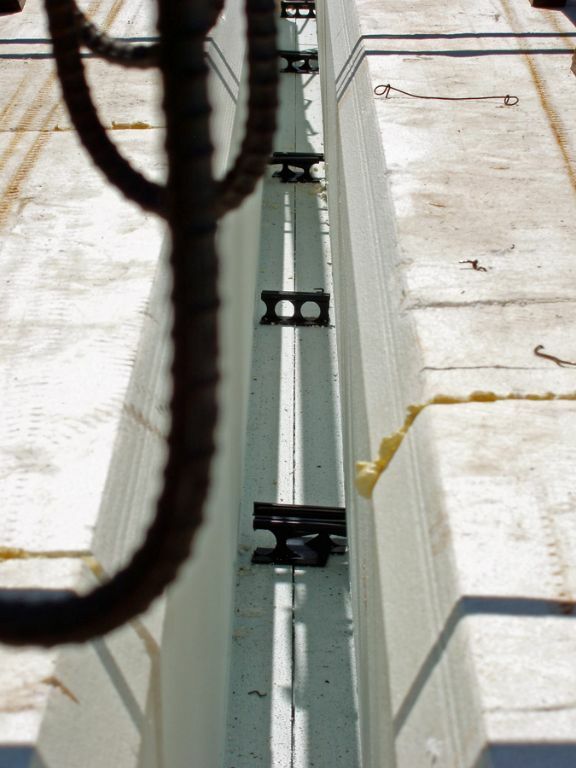 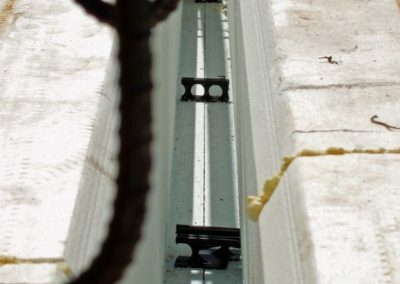 To maintain stiffness on these overhangs, the ICF flooring system required additional EPS that increased the depth of the ribs from 7 inches to 18 and 24 inches as required. 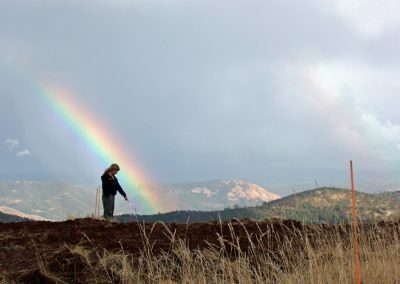 As the rainy season gave way to summer, weather became more of a concern. 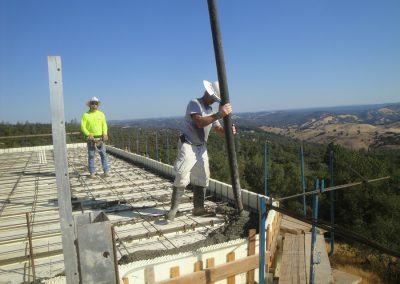 Some days reached 114 degrees at the jobsite. 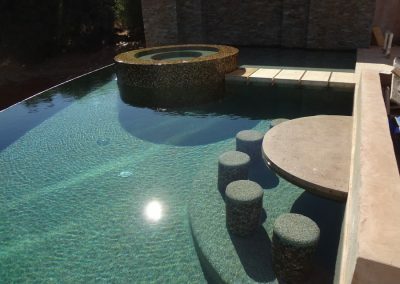 Sunglasses and frequent water breaks became mandatory. 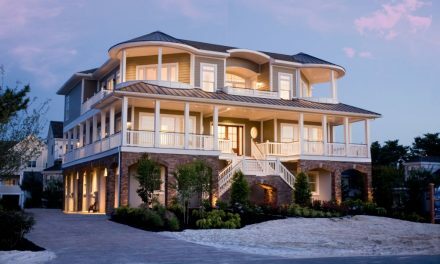 As the home progressed, its reputation spread further. 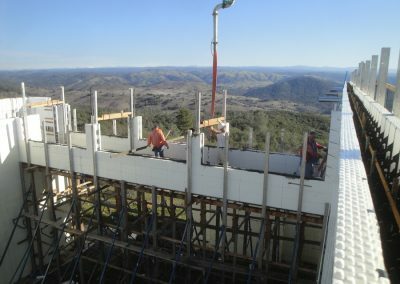 Nikiforuk says, “We’ve had visitors from all the western states, as well as Iowa, New York, Kentucky, Ohio, Michigan, Colorado, Florida, Georgia and Maryland. 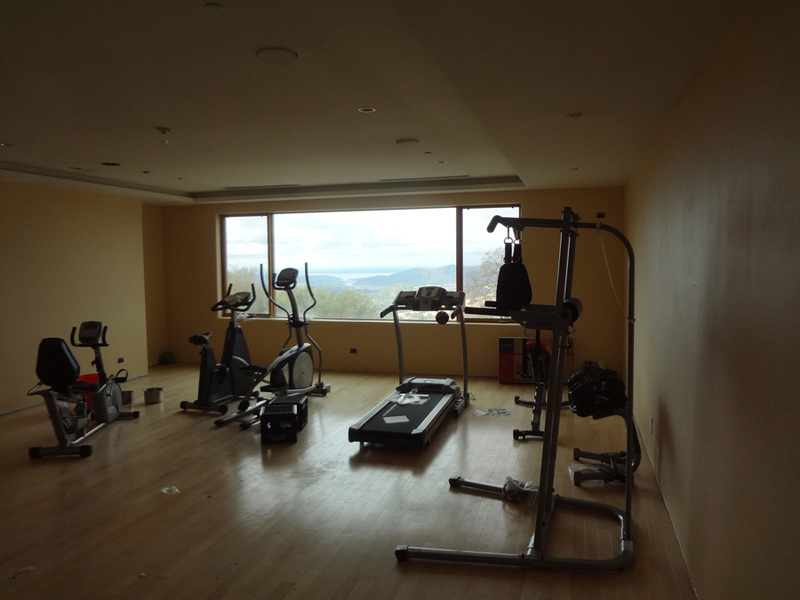 We’ve also educated foreign visitors from Canada, England, Egypt, Mexico, Switzerland, and Germany. 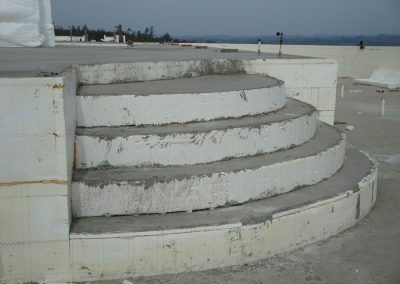 Not all those visitors were satisfied with a simple tour. 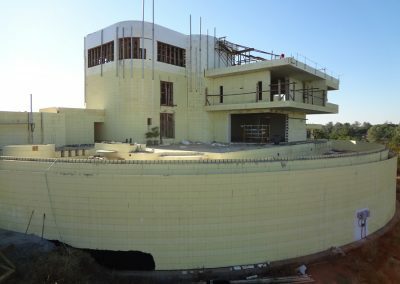 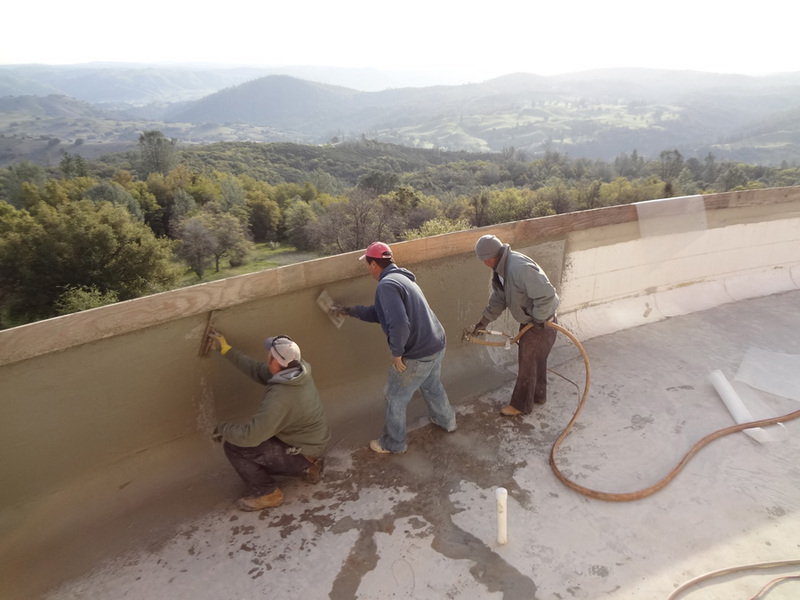 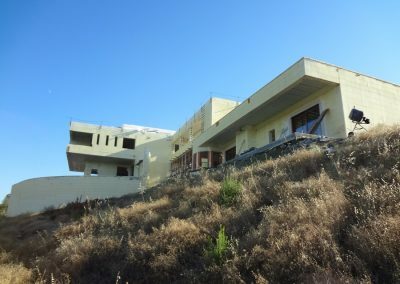 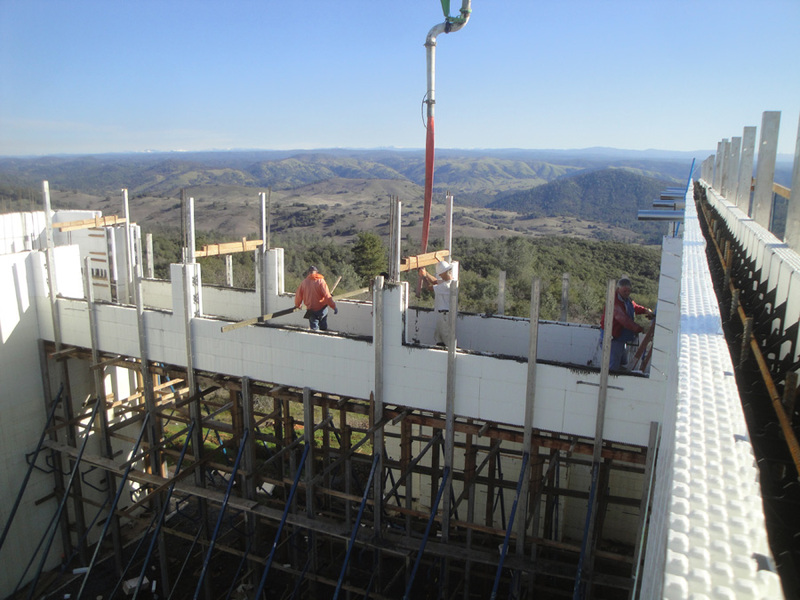 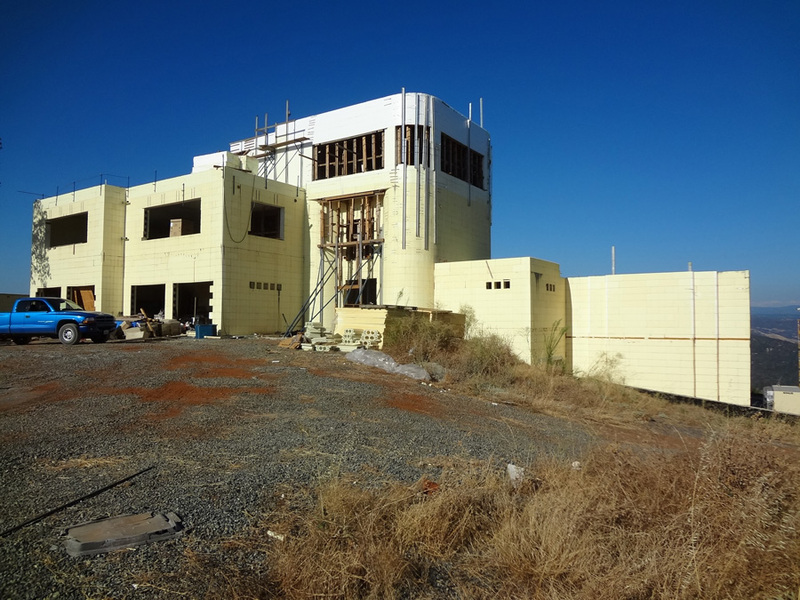 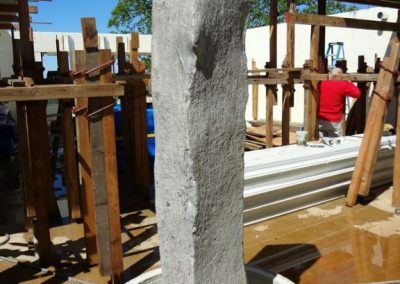 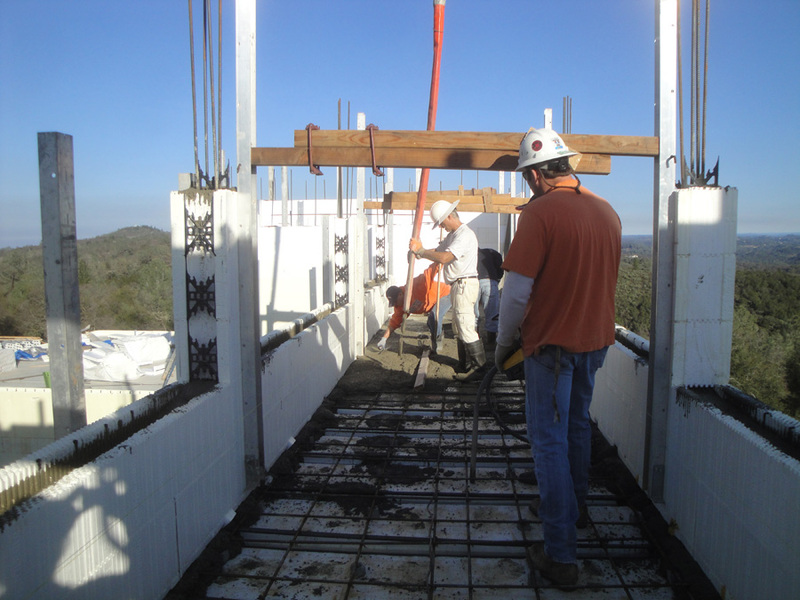 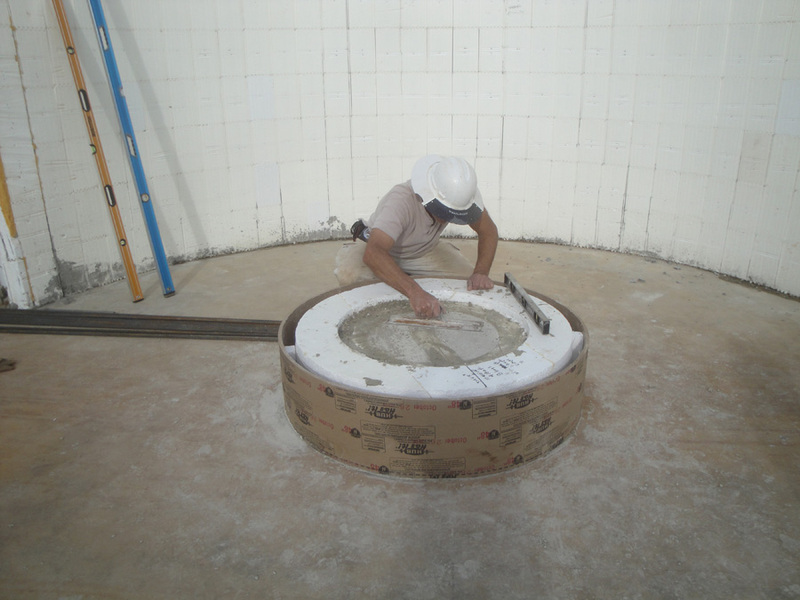 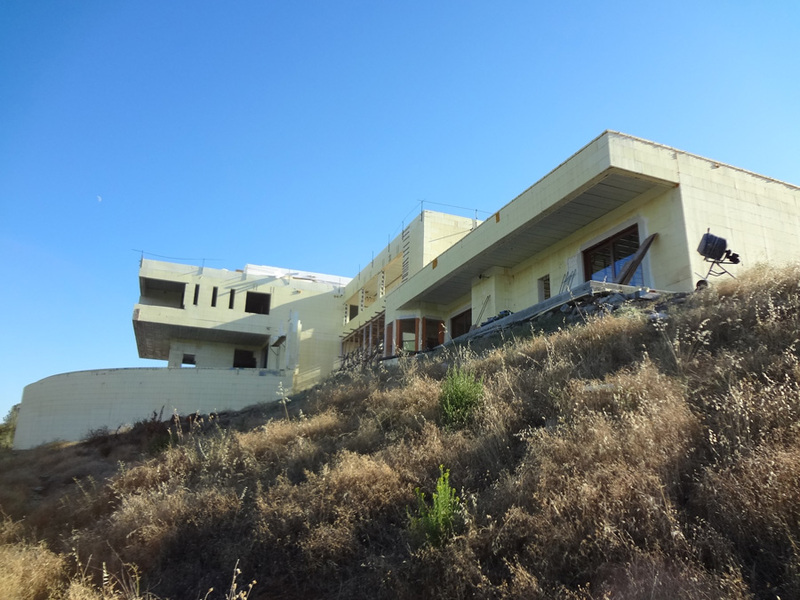 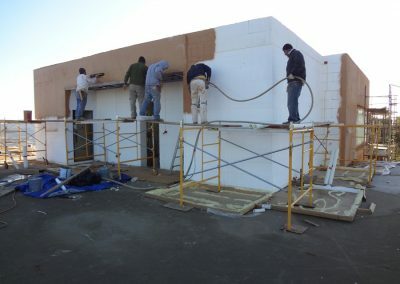 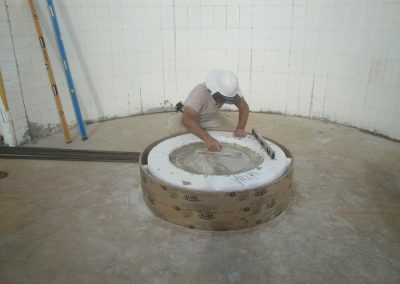 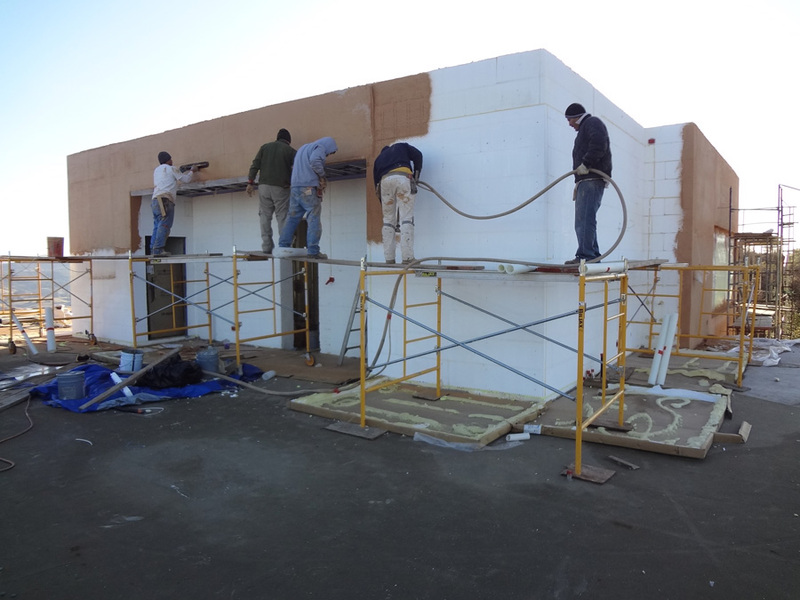 The Casa Bella Verde project was used as a training site for contractors and individuals wanting advanced ICF training. “We had as many as 12 people at a time assembling walls, installing bracing and assisting on pour day,” says Nikiforuk. 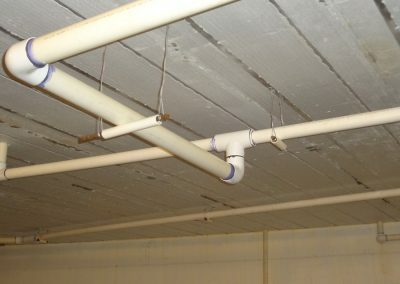 These “trainer crews” changed weekly. 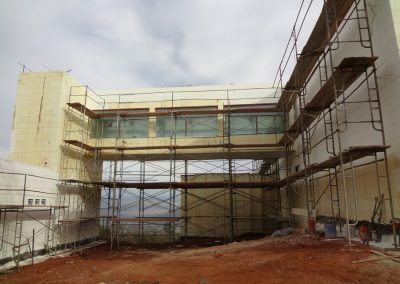 He adds that in addition to the onsite education, the construction and design team has also given lectures and seminars to building inspectors, county engineers, concrete manufactures, contractors and material suppliers. 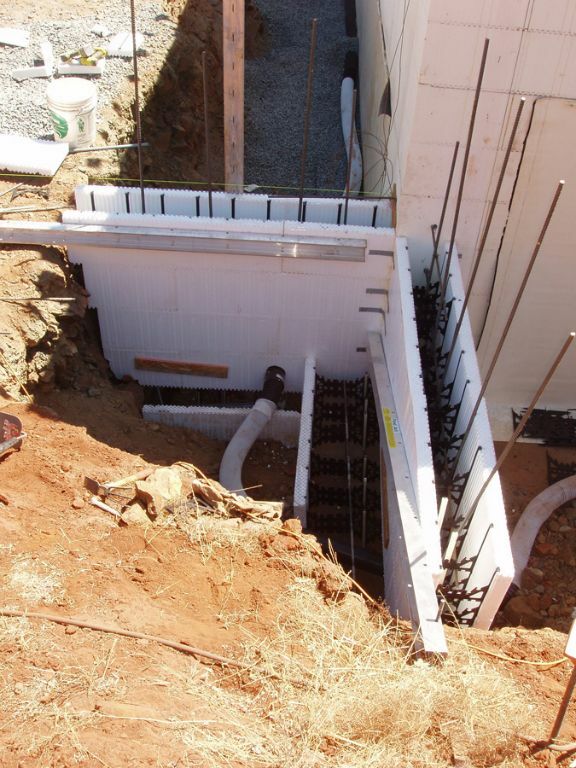 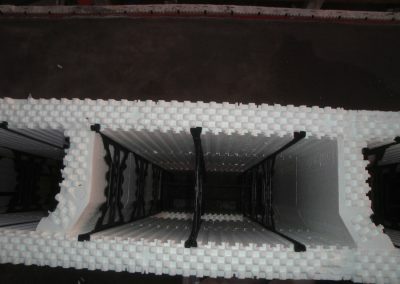 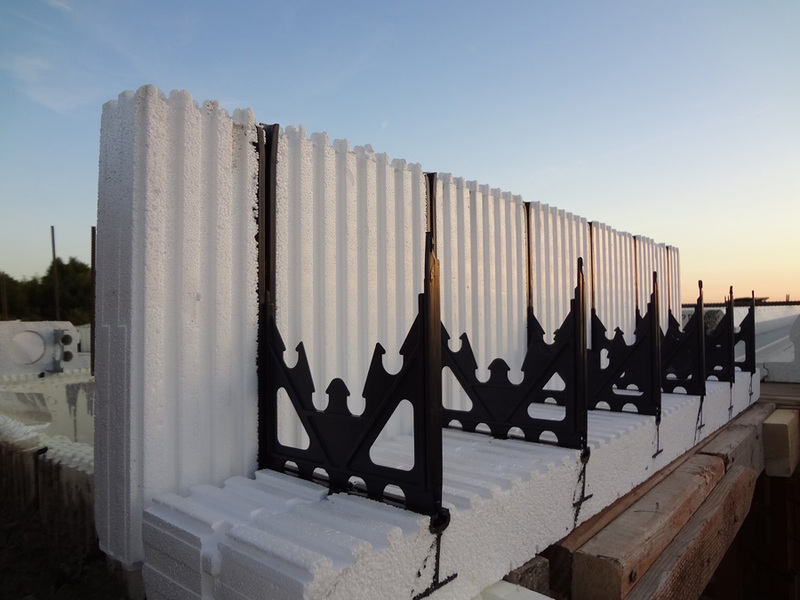 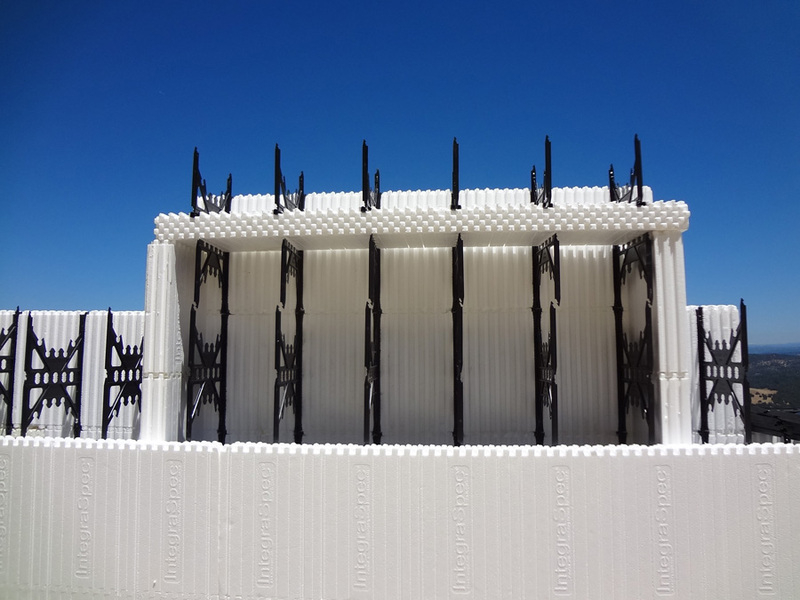 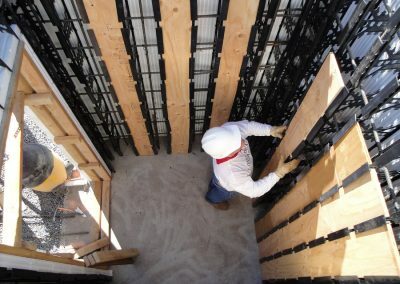 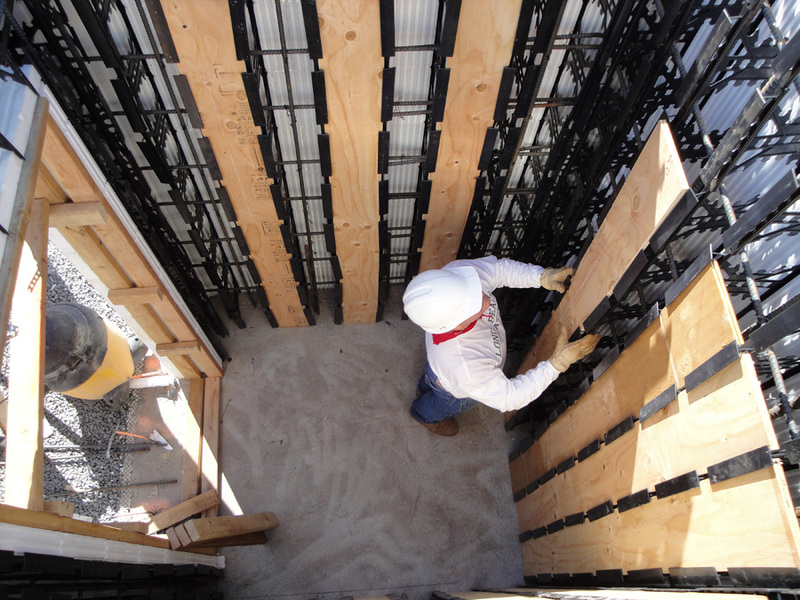 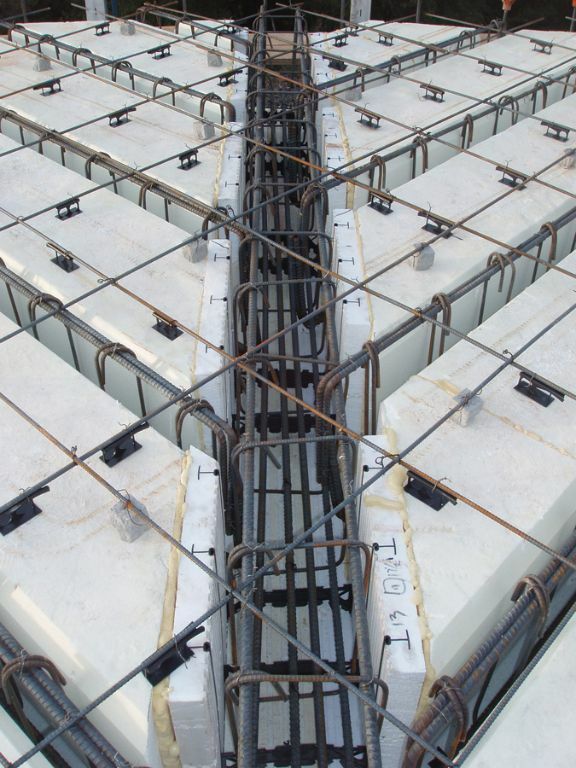 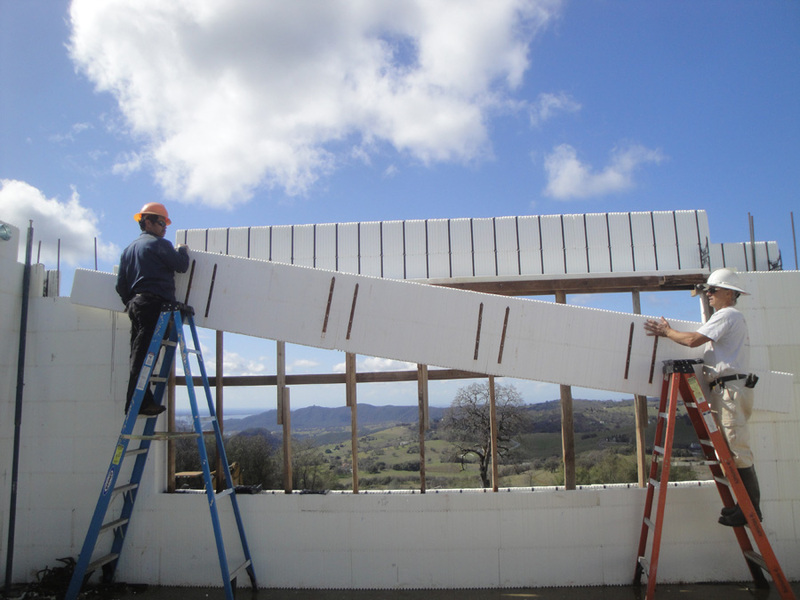 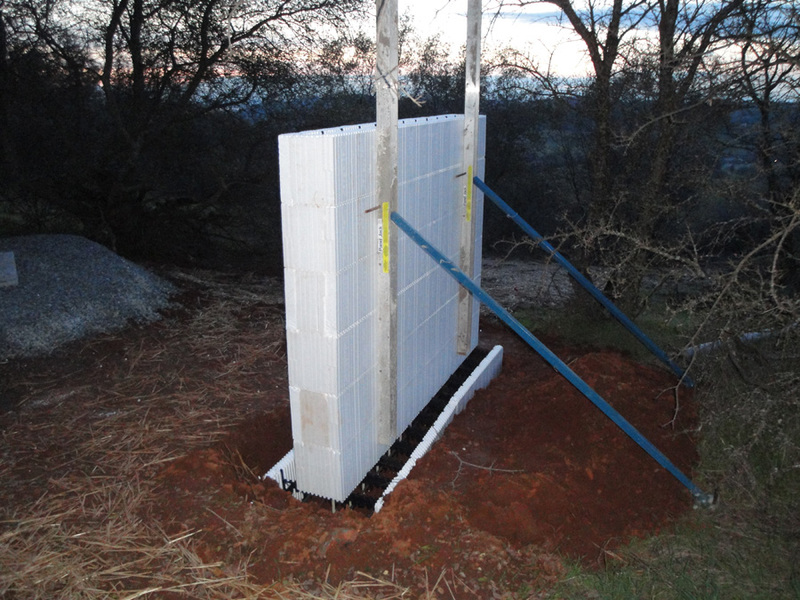 It is directly responsible for at least nine other homes being built with ICF. 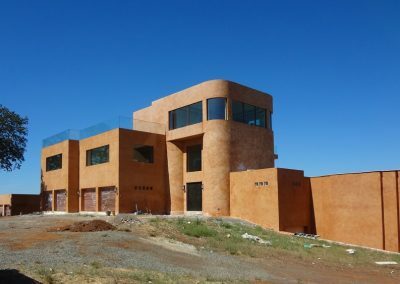 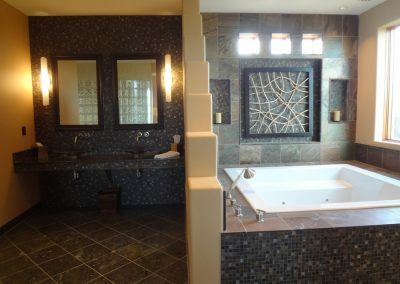 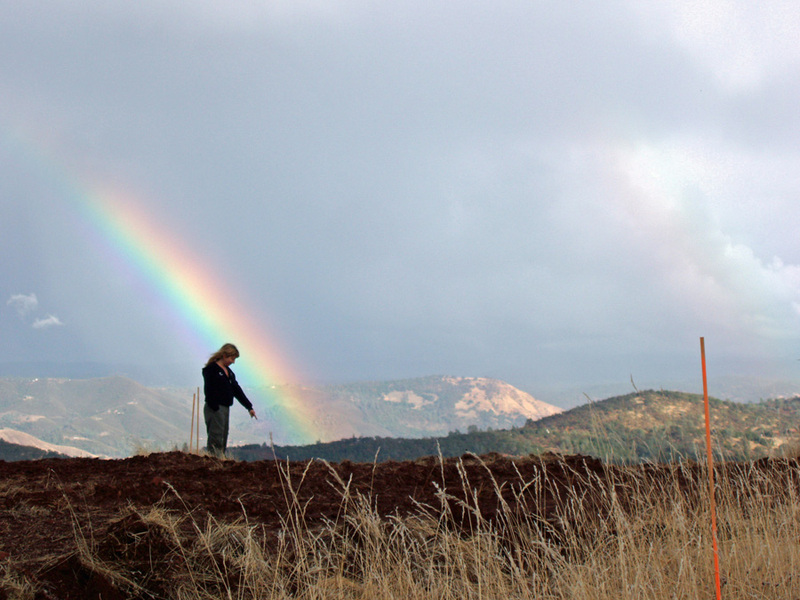 Casa Bella Verde is notable for more than just ICF training and creativity, though. 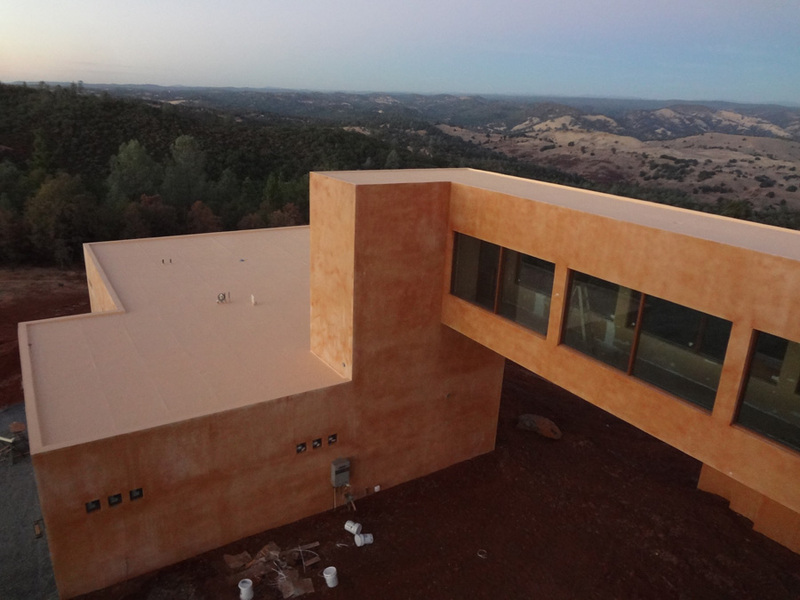 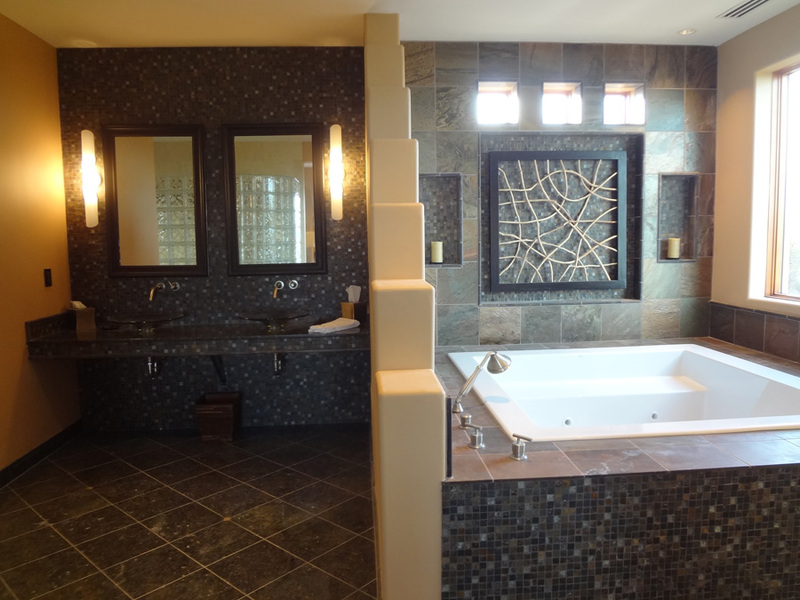 The residence is a near-zero energy design, with LED lighting and onsite wastewater treatment. 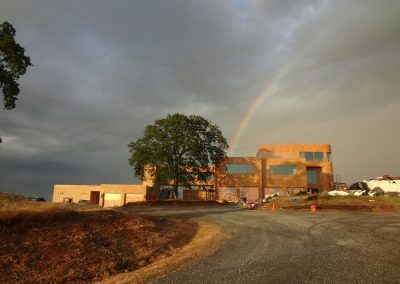 The paperwork for LEED certification has been submitted, and the preliminary report states it easily qualifies for LEED-Platinum status. 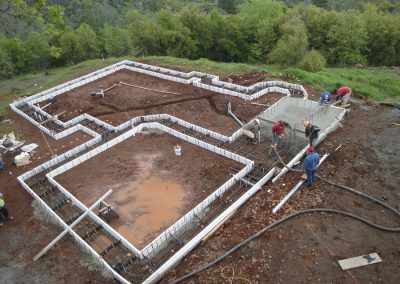 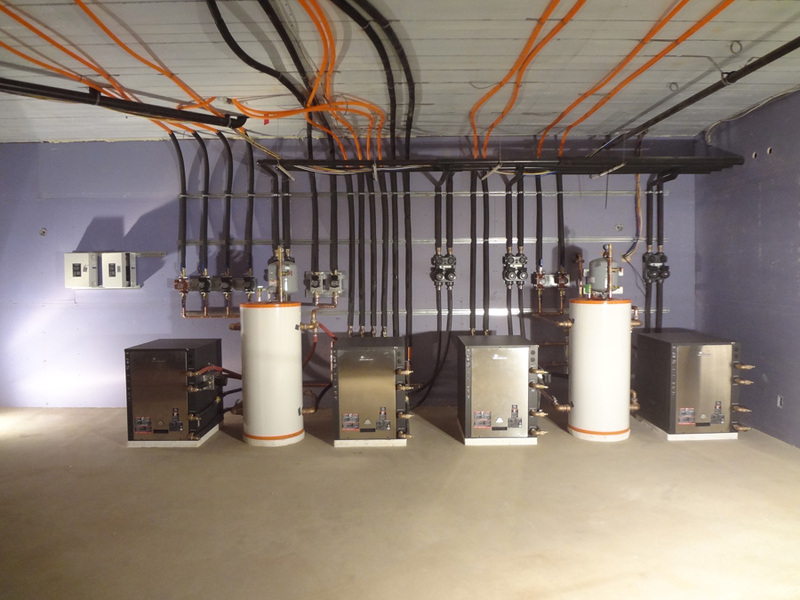 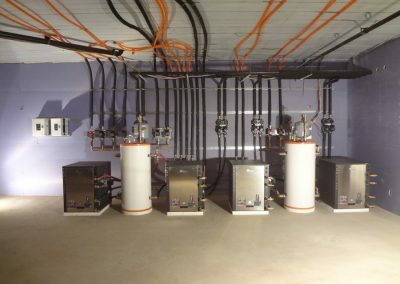 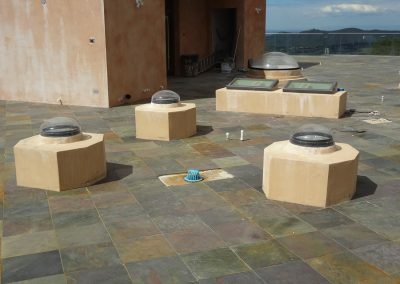 The house is heated and cooled by a geothermal exchange system which consists of four heat exchangers and ten 300-foot-deep ground loop wells. 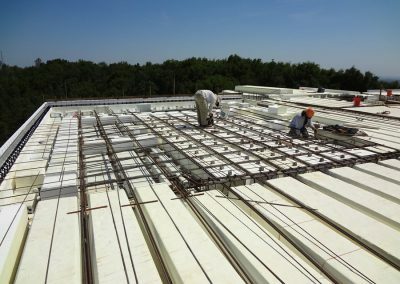 On the rooftop, 95 photovoltaic solar panels provide power to the home. 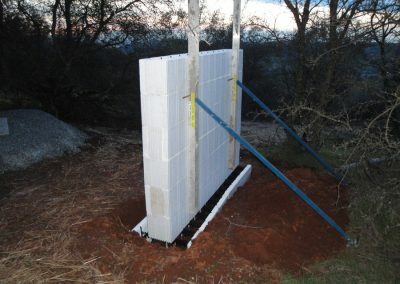 Excess power is sold back to the utility grid. 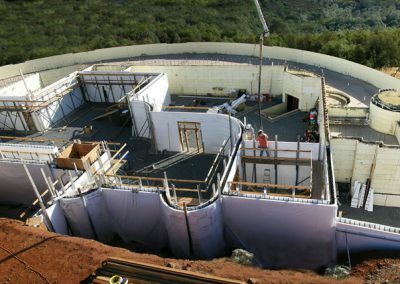 To date there has been zero energy cost for heating and cooling, and the structure’s thermal mass has been performing as designed. “Once all the systems are fine tuned and adjusted, we anticipate being at net zero for energy consumption for the entire property,” reports Briana Alhadeff, owner of the home. 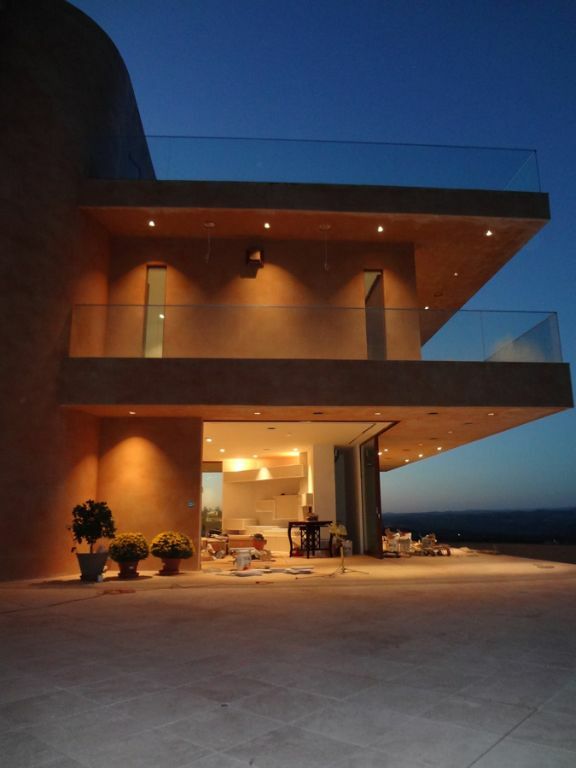 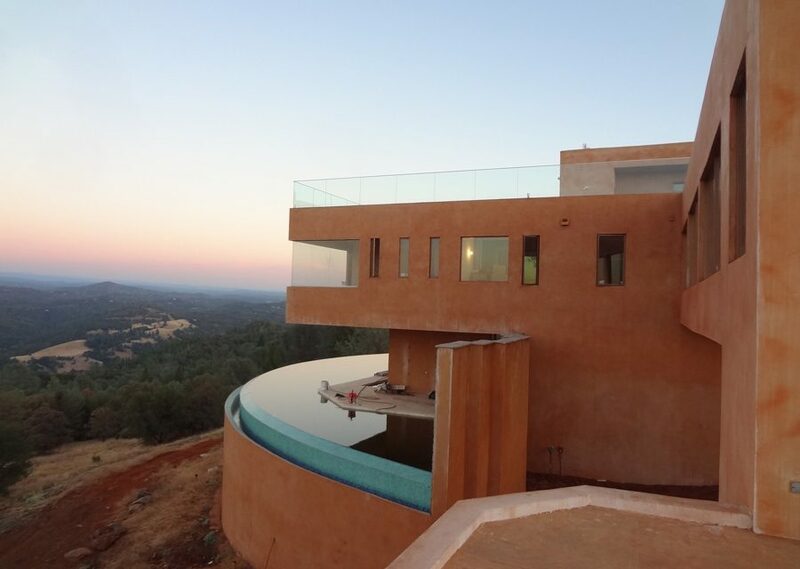 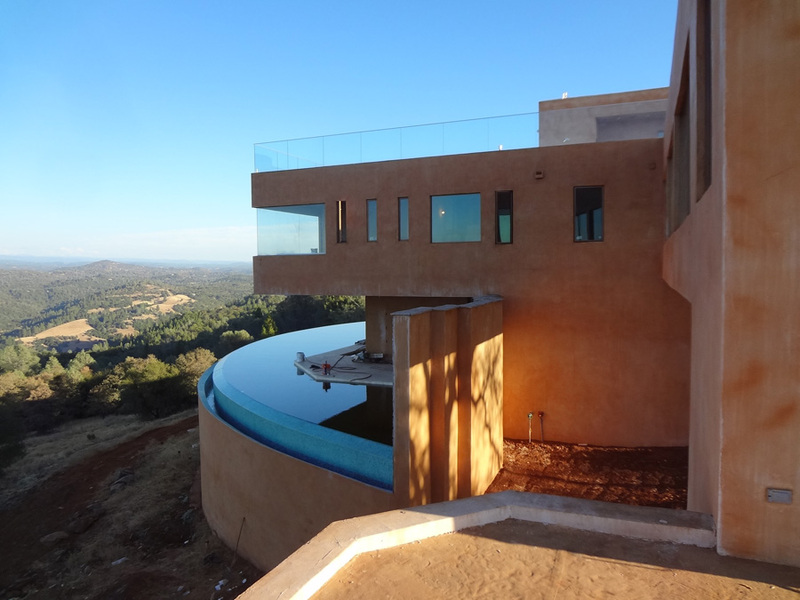 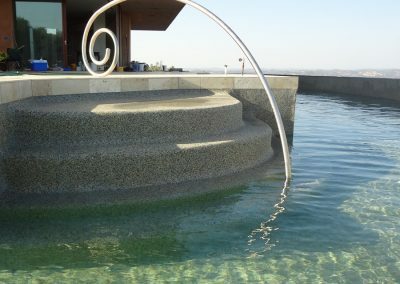 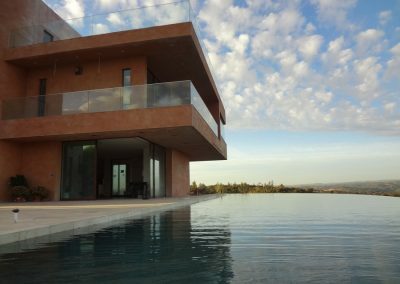 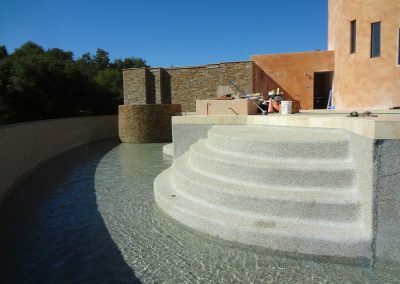 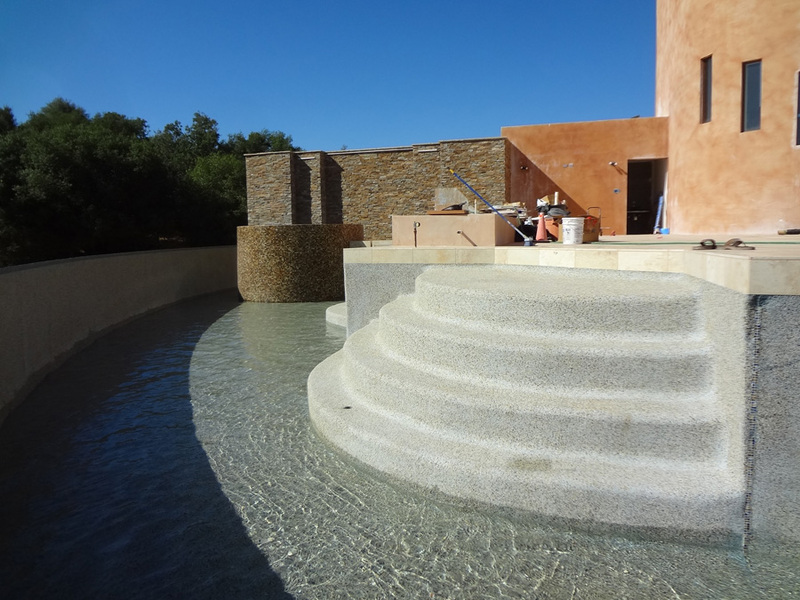 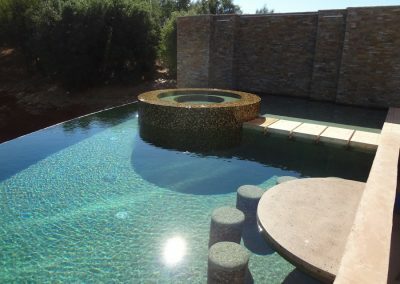 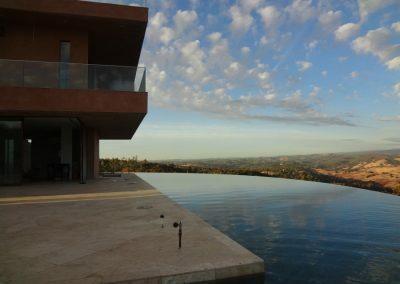 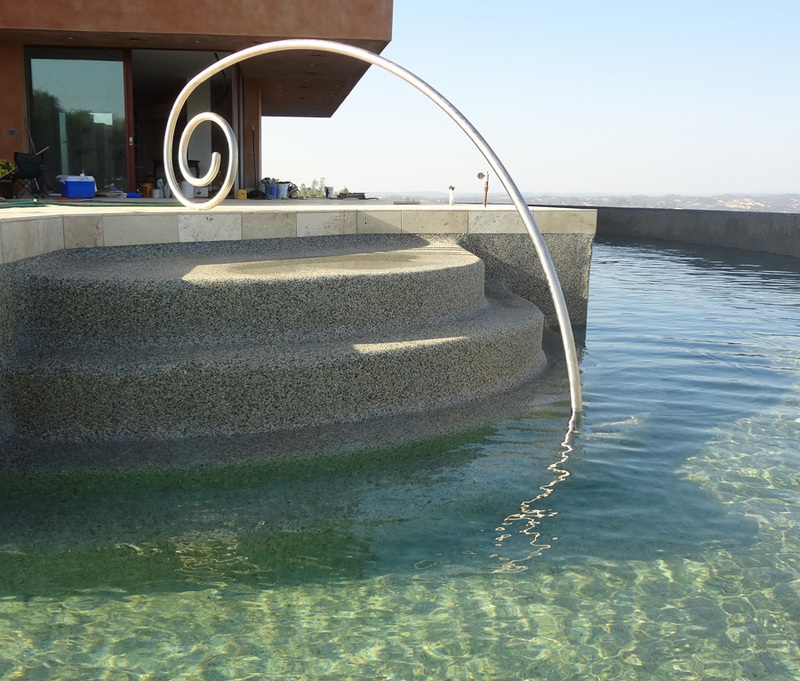 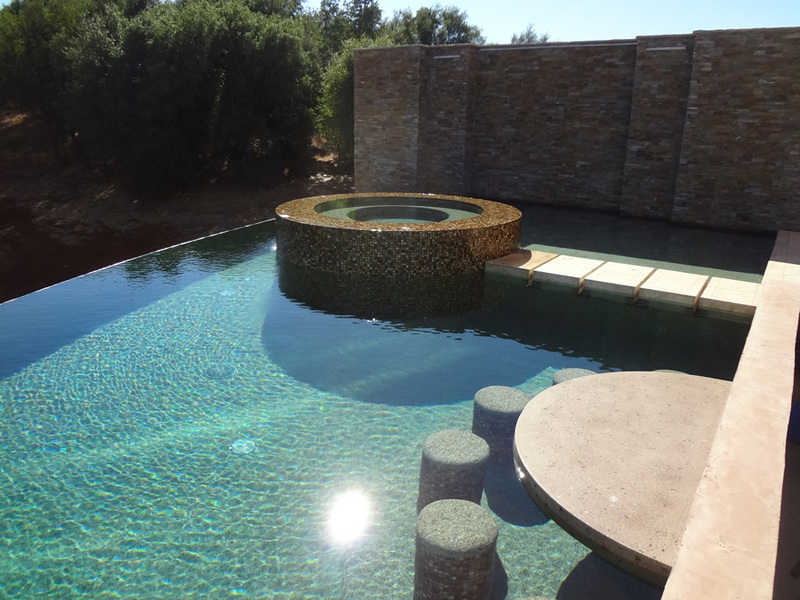 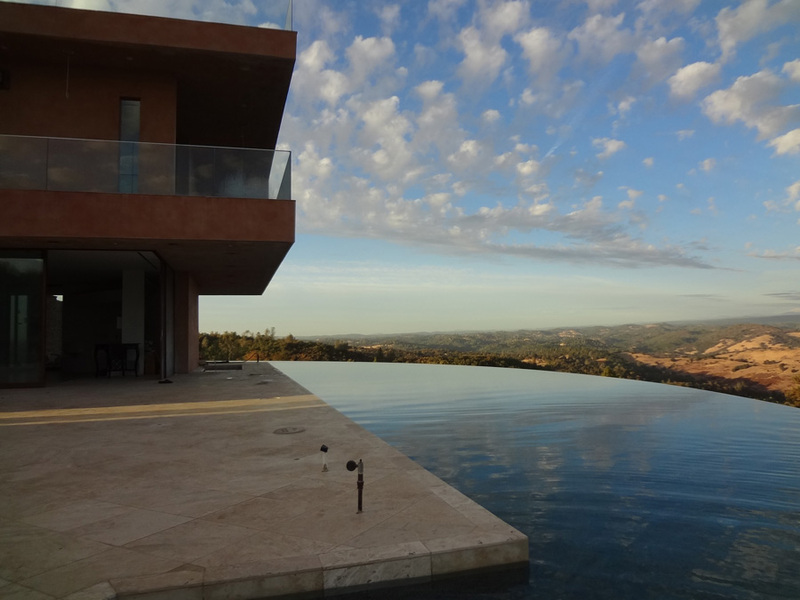 Consuming about 1,800 yards of concrete, Casa Bella Verde is a showcase of resilient construction. 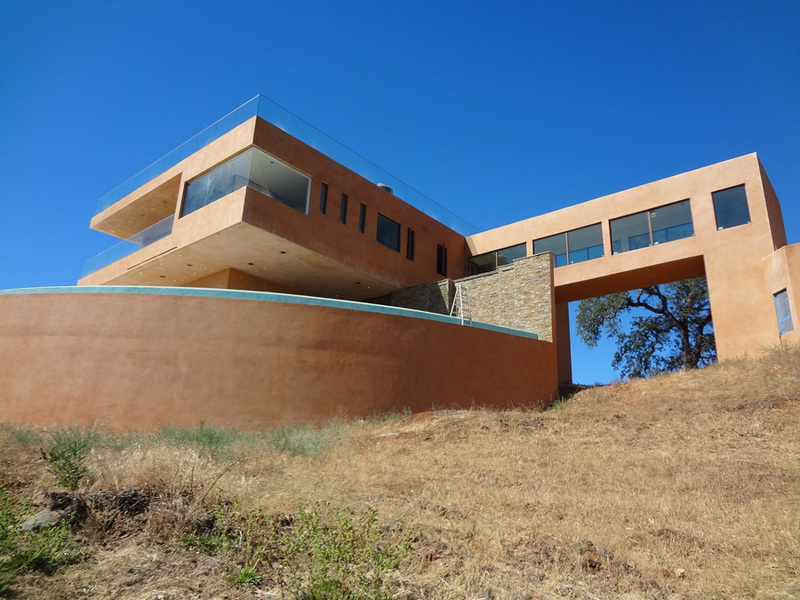 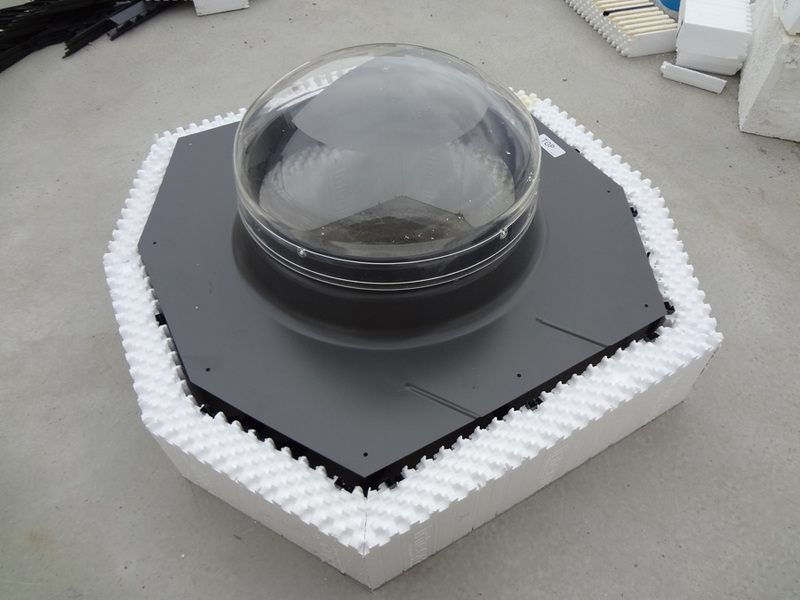 It was designed to withstand earthquakes, tornados, fire, termite infestation and water penetration. 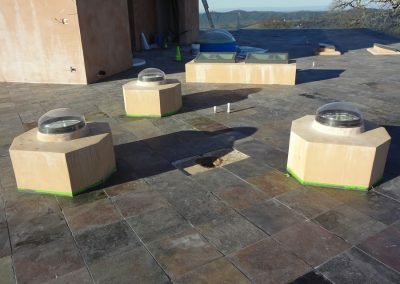 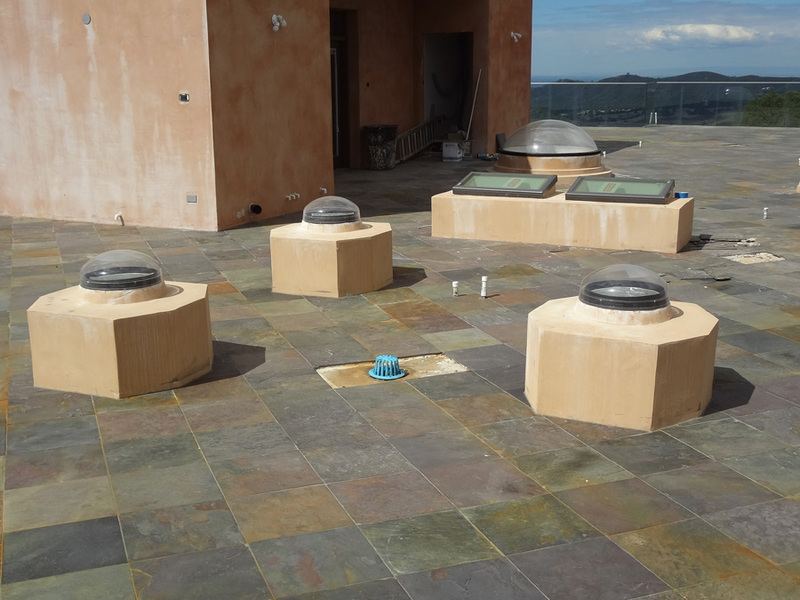 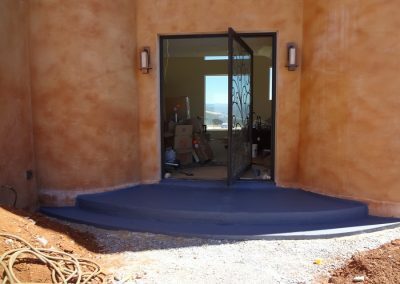 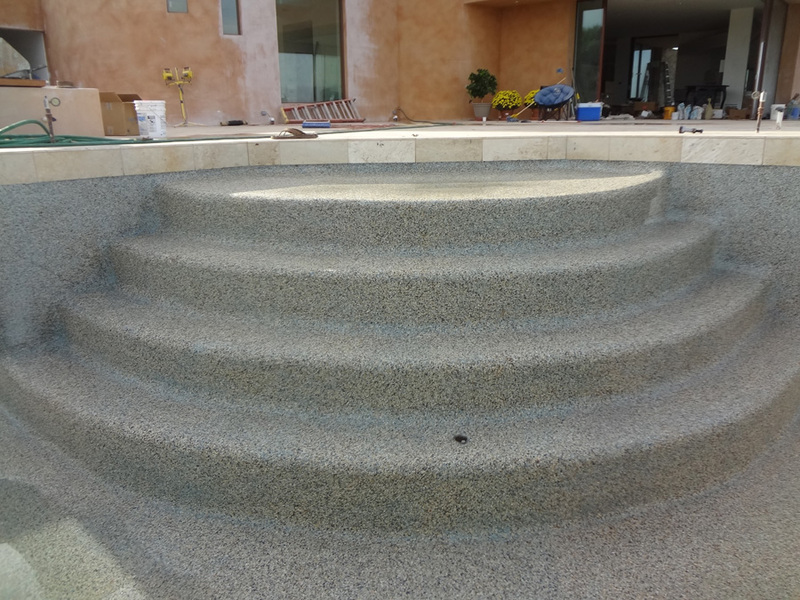 The exterior finish is stucco and the outdoor deck areas are slate and travertine. It’s stunning architecturally, too. 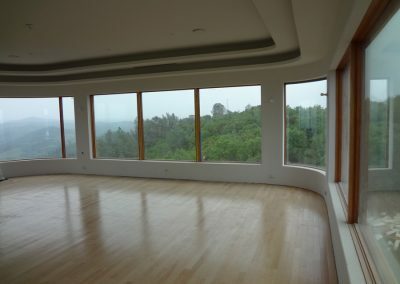 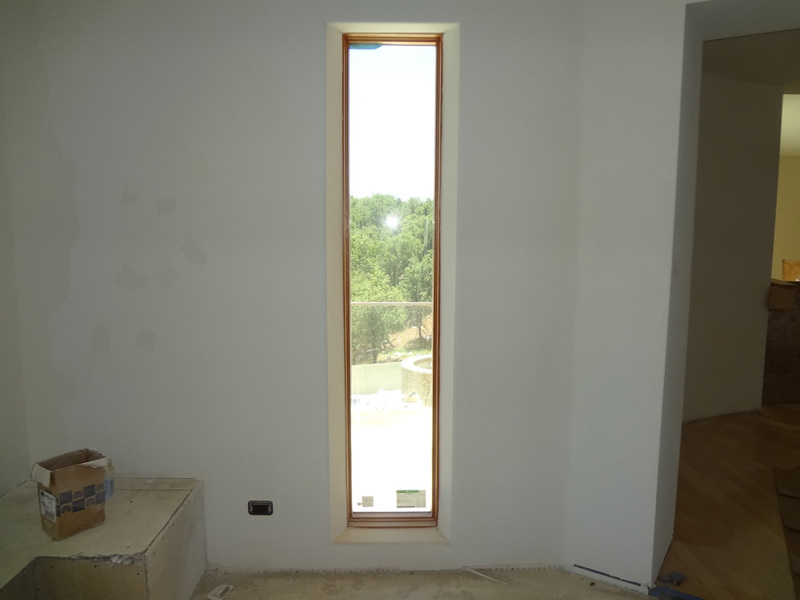 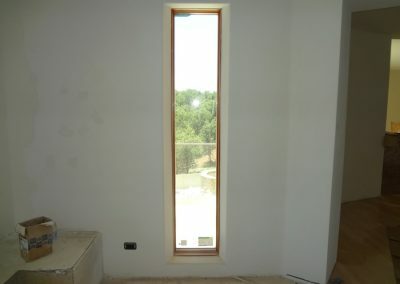 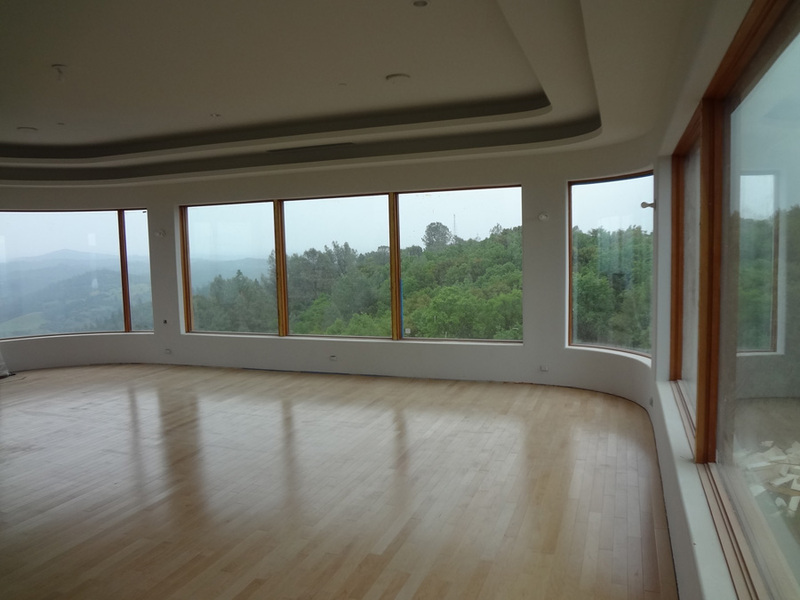 Every window was situated to capture views of the surrounding hills. Walking through the custom-designed, swing-glass front door, visitors enter a 26-foot-high grand foyer. 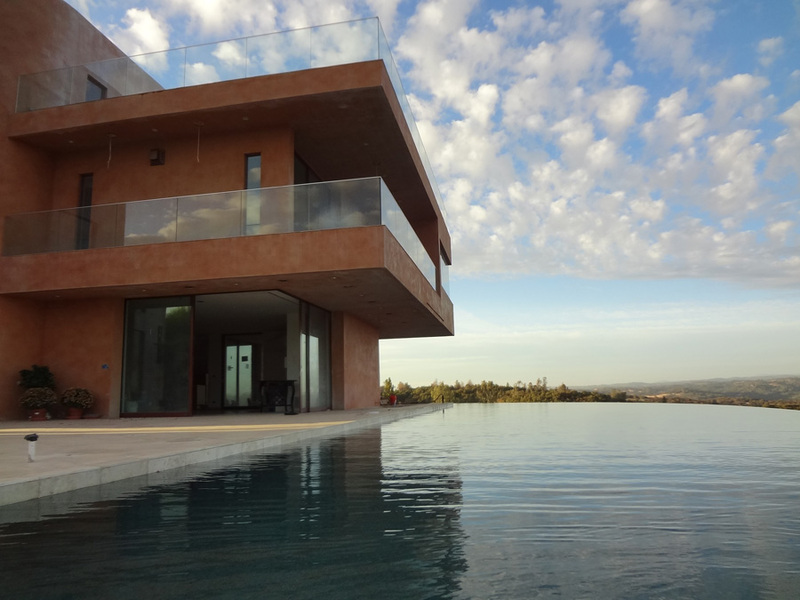 Two floor-to-ceiling windows look out over the infinity-edge pool with a backdrop of the Sierra Nevada mountain range. 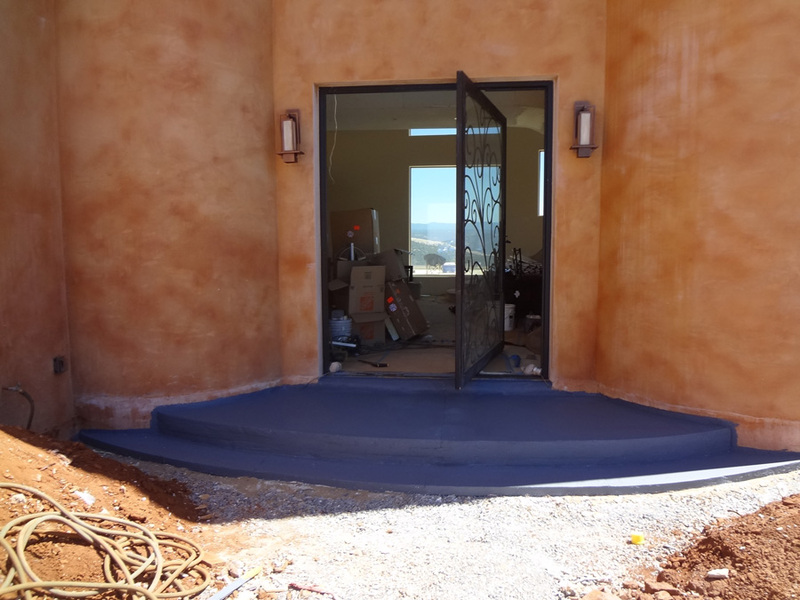 At the base of the windows a magnificent curved stair case leads to an ICF catwalk to the second floor. 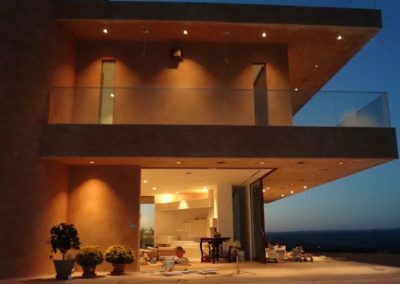 National magazines have written articles on Casa Bella Verde, including Innovative Home, GB &D magazine, Concrete Homes, Residential Systems, and Walls and Ceilings magazine. 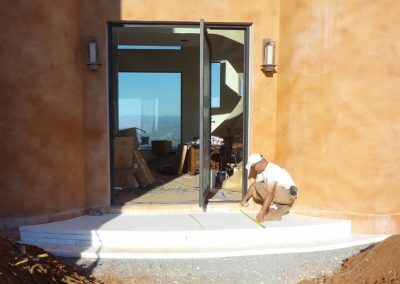 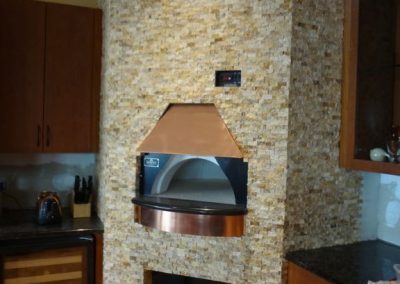 The Casa Bella Verde website has had thousands of inquiries and hits, and the construction newsletter had more than 400 subscribers. 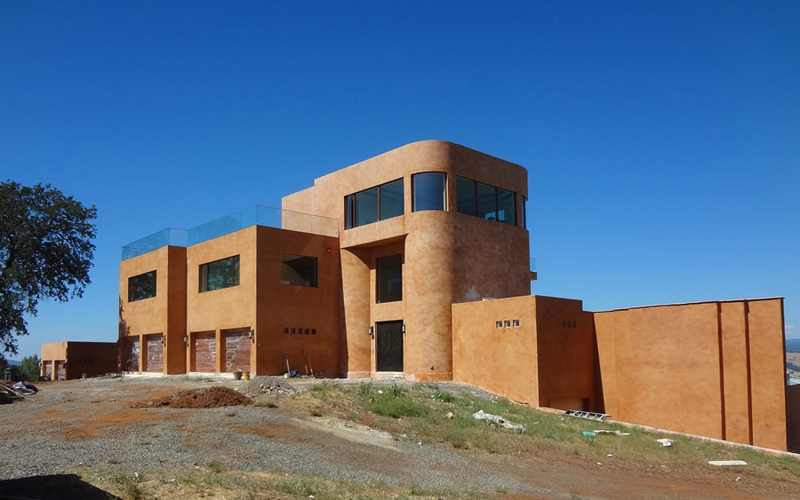 Casa Bella Verde’s role as an ambassador for the industry isn’t finished yet. 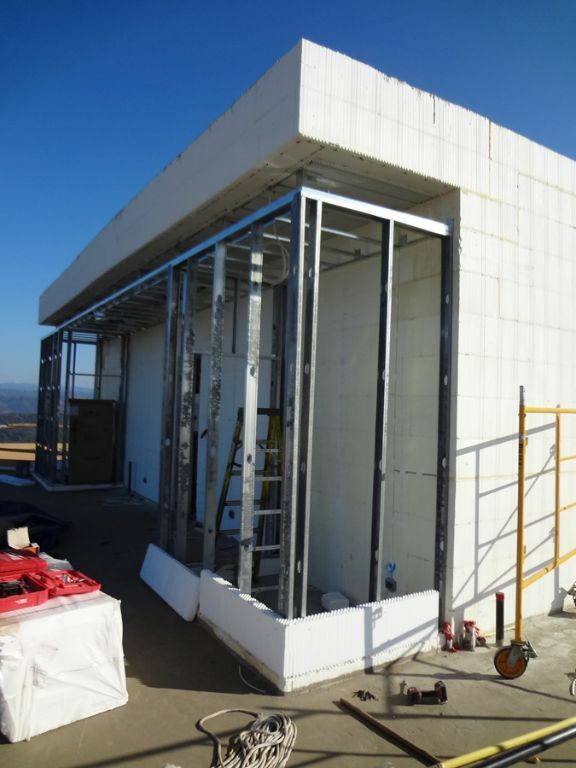 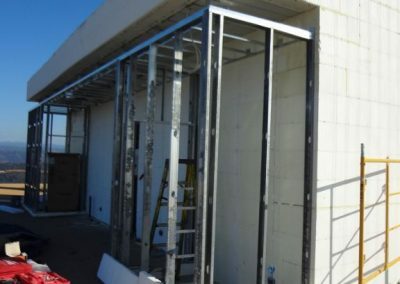 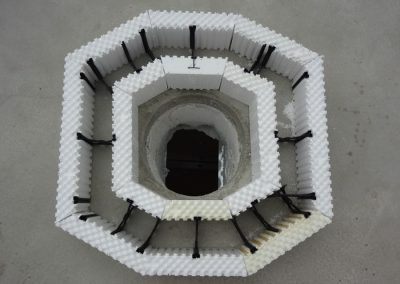 All exterior walls have thermal sensors imbedded in the concrete tracking core, outside and inside temperatures, data which will be used by future designers and engineers. 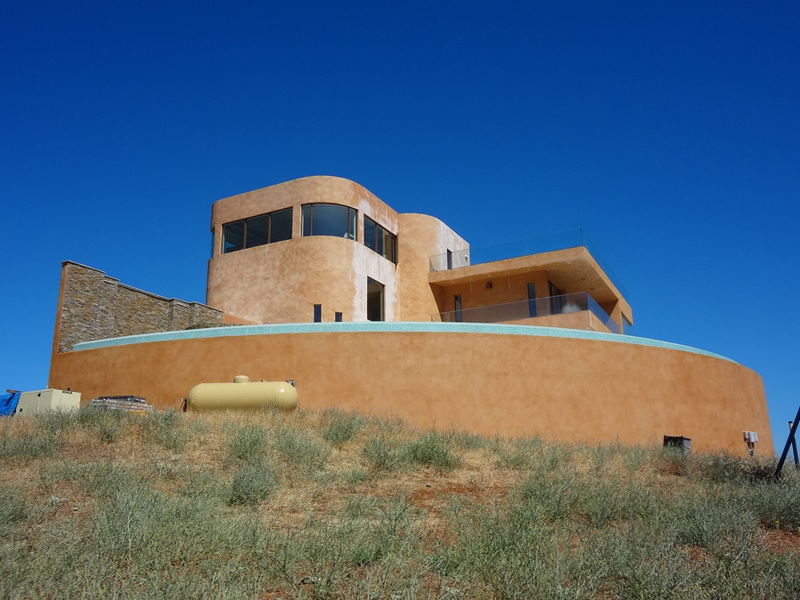 And the home will continue to be available for occasional tours. 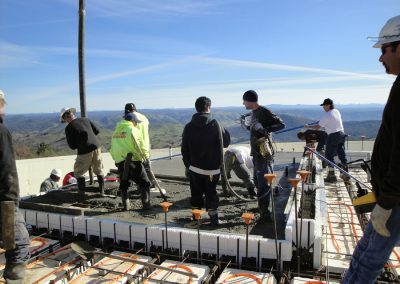 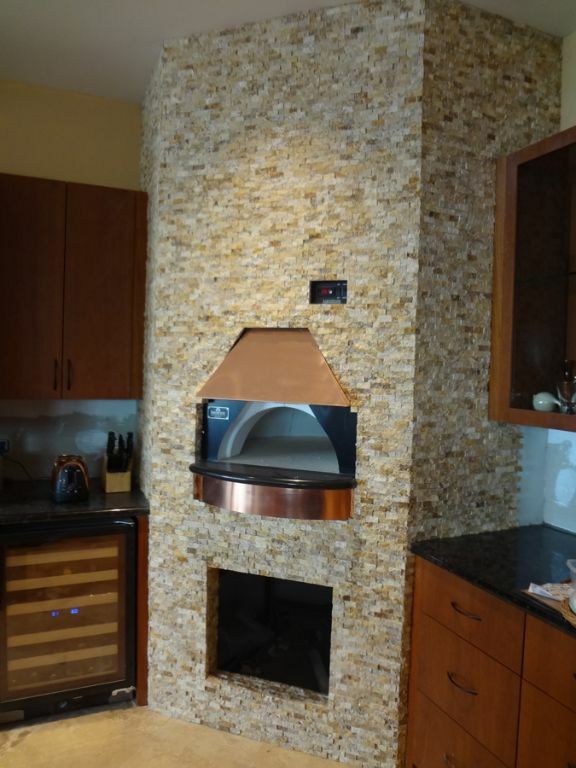 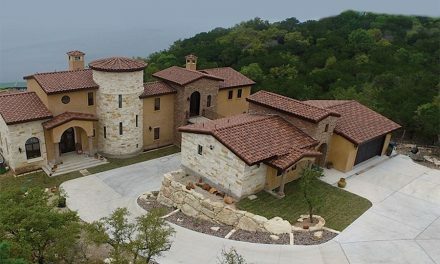 Provided advanced training for dozens, including at least 12 custom builder crews, numerous design professionals, and visitors from 16 states and 7 foreign countries.